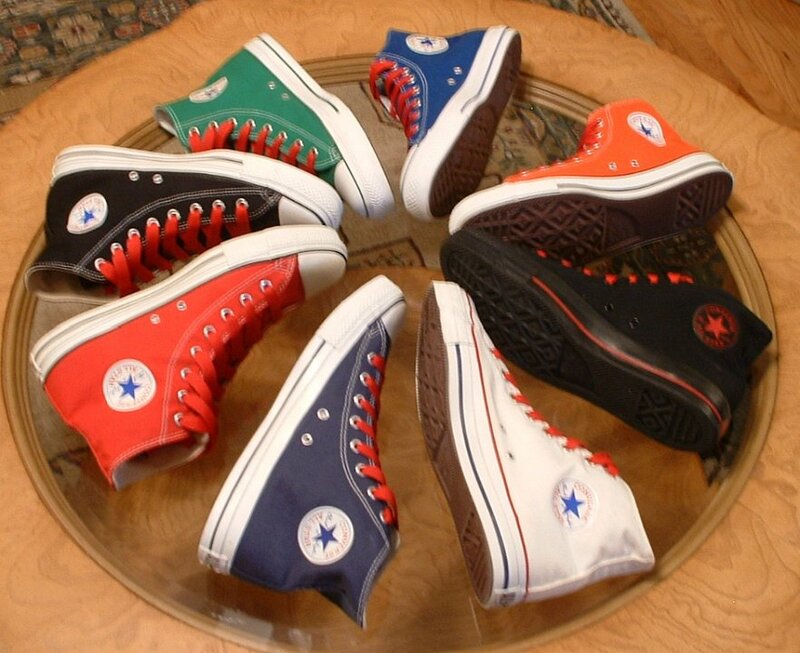 Group shots of chucks in various color combinations. 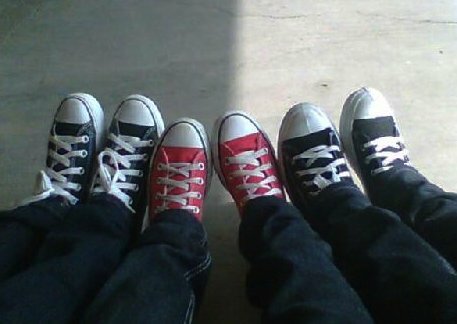 1 Group Shots of Chucks Black and red high tops foot to foot. 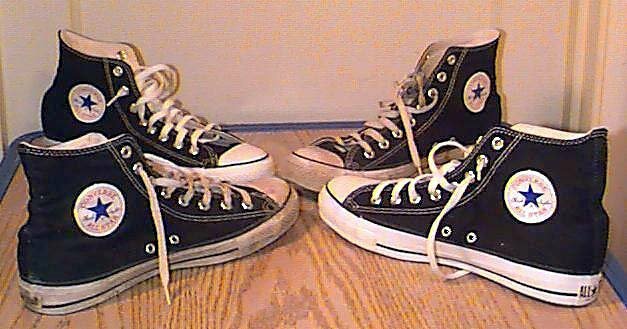 2 Group Shots of Chucks Black high tops, arranged from brand new to well worn. 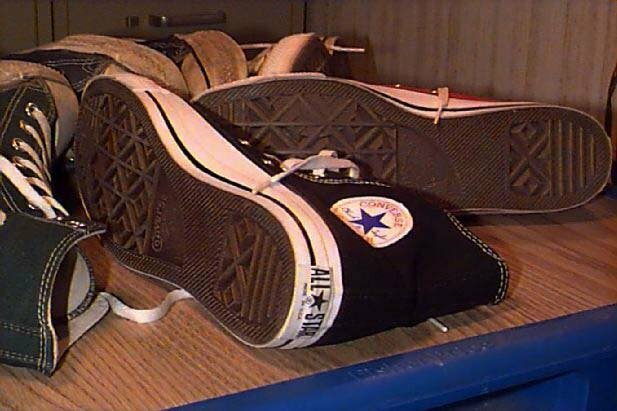 3 Group Shots of Chucks New and worn black high tops, inside patch views. 4 Group Shots of Chucks New and worn black high tops, side and sole views. 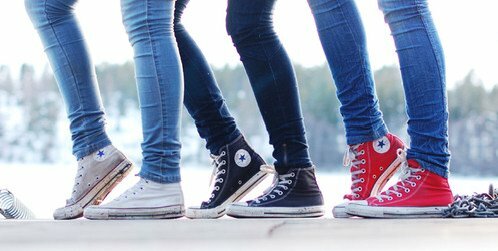 5 Group Shots of Chucks Several pairs of new black high tops. 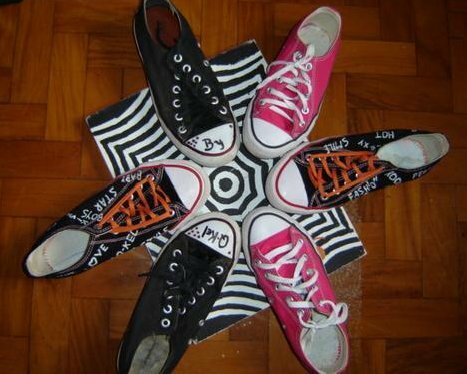 6 Group Shots of Chucks Worn black high top chucks, inside patch view. 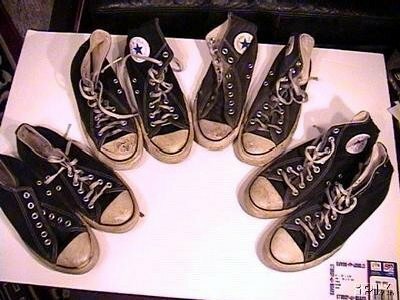 7 Group Shots of Chucks Half circle of black high top chucks. 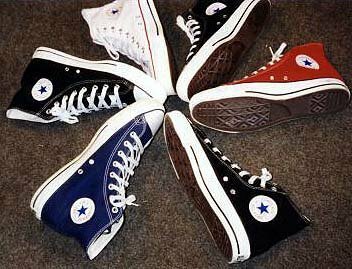 8 Group Shots of Chucks Circle of black, blue, maroon, and white high top chucks. 9 Group Shots of Chucks Pairs of brand new black high top chucks, including two vintage pairs. 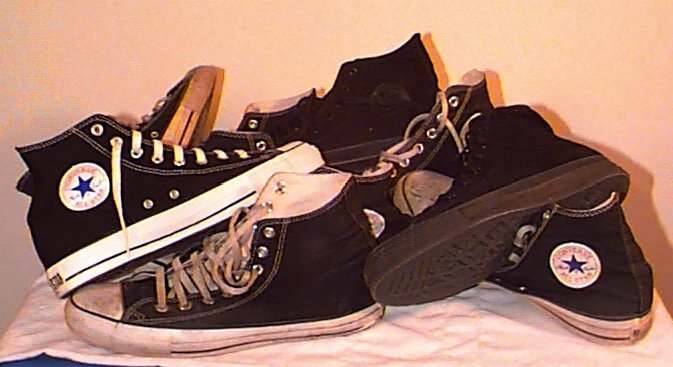 10 Group Shots of Chucks Mix of new and old black high top chucks. 11 Group Shots of Chucks Four pairs of worn black high top chucks. 12 Group Shots of Chucks Black and white shot of people wearing black and white pairs of chucks. 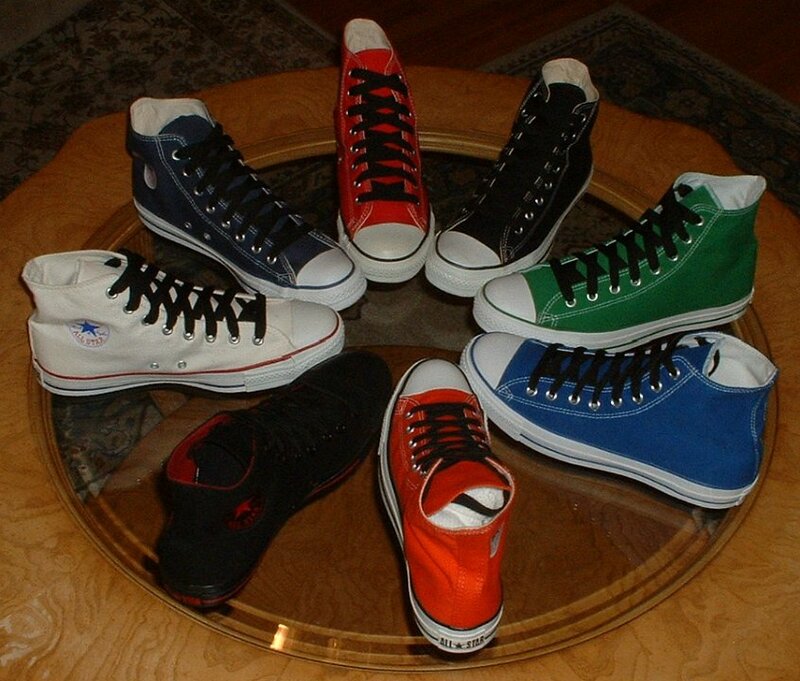 13 Group Shots of Chucks Caribbean blue and taupe high top chucks. 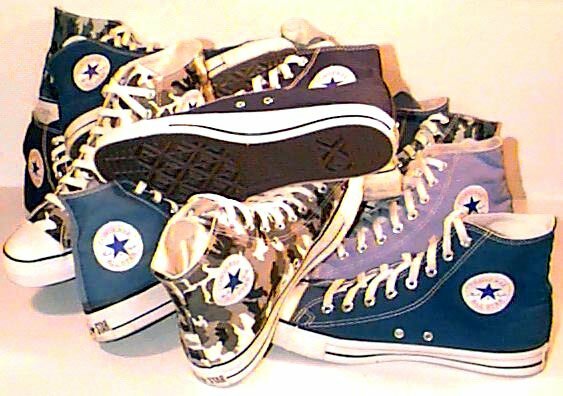 14 Group Shots of Chucks Pile of blue high tops, including sky blue, camouflage blue, navy blue, and caribbean blue chucks. 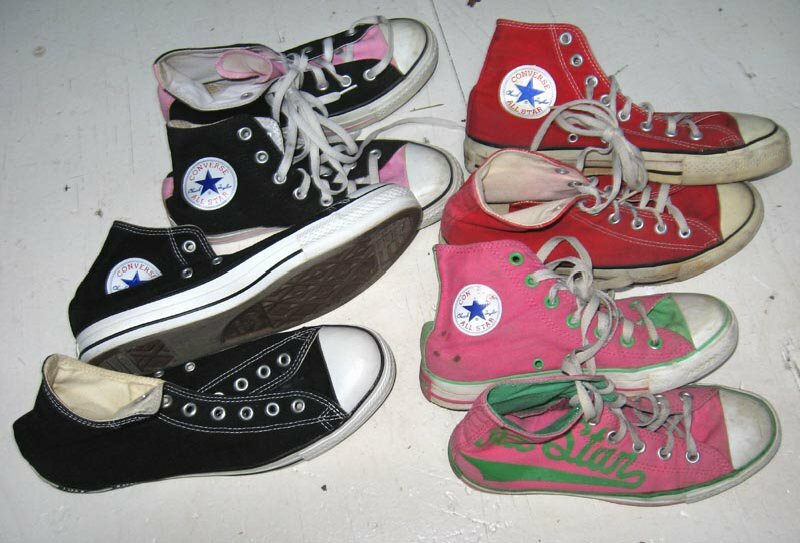 15 Group Shots of Chucks Pile of worn Chuck Taylor high tops, including the core colors of black, white, blue, and red. 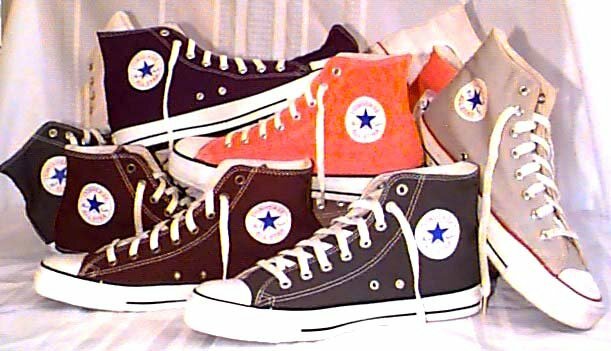 16 Group Shots of Chucks Pile of high top chucks, including chocolate brown, grey, pine, and orange. 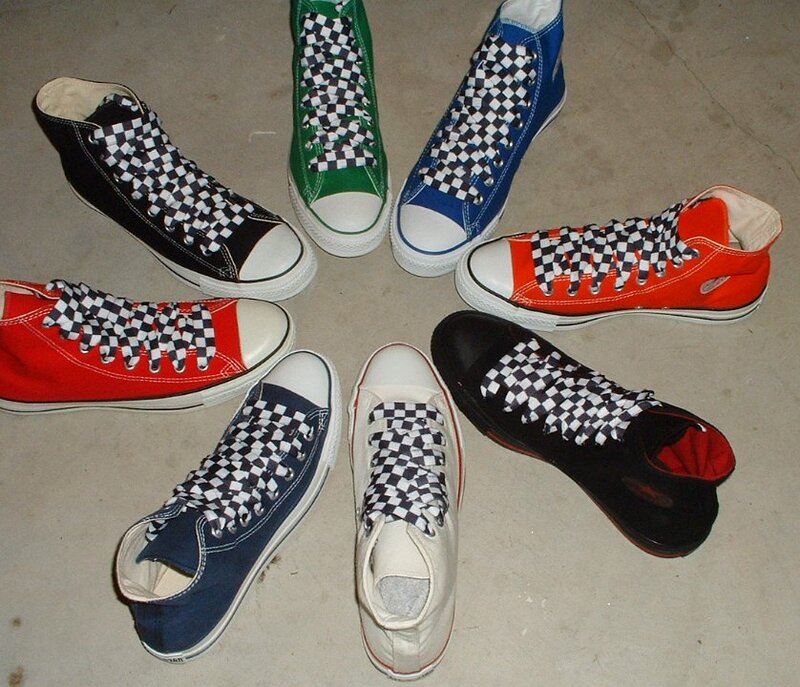 17 Group Shots of Chucks Core color chuck high tops from the nineties. Note the wrong patch for the monochrome black. 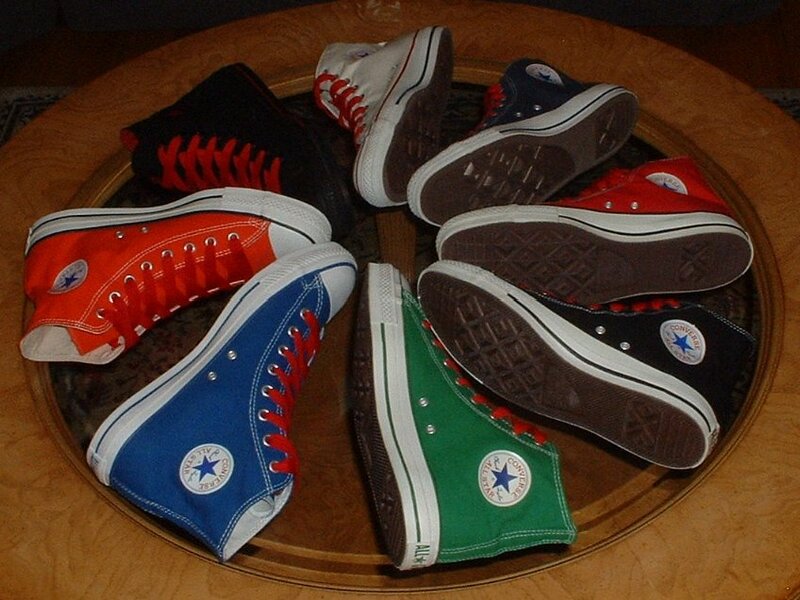 18 Group Shots of Chucks Pile of core color low cut chucks from the nineties. 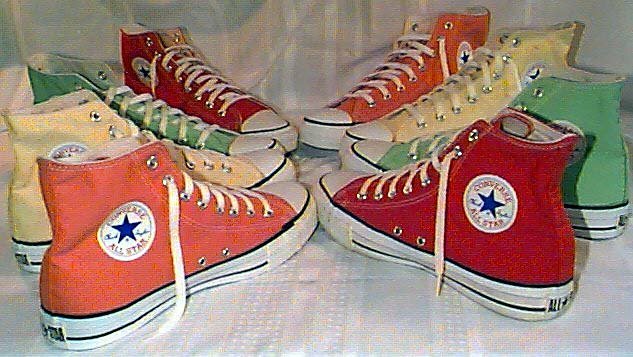 19 Group Shots of Chucks Seasonal color high top and low cut chucks. 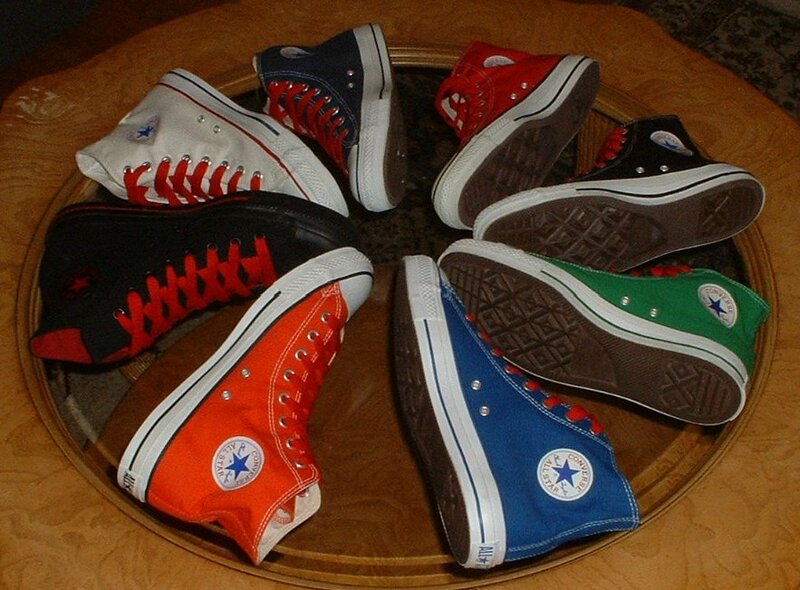 20 Group Shots of Chucks Pile of high top and low cut chucks, including pumpkin, chino, sky blue, stars and bars, optical white, royal blue, and yellow. 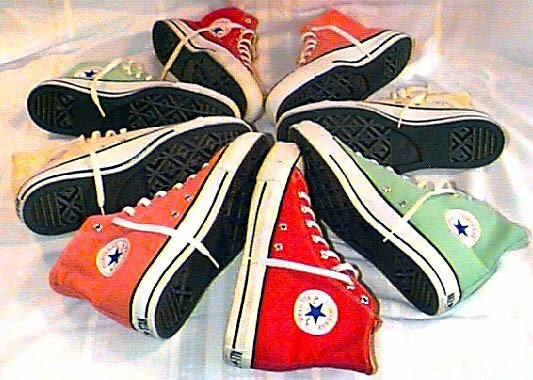 21 Group Shots of Chucks Pile of seasonal color high top chucks, including flame orange, banana, huckleberry, and flourescent green. 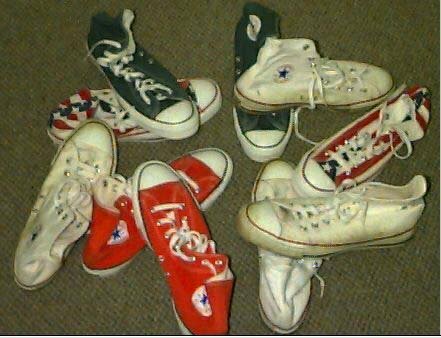 22 Group Shots of Chucks Pile of worn high top chucks, including unbleached white, optical white, red, stars and bars, and navy blue. 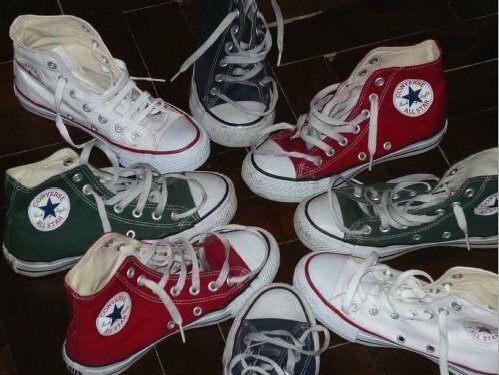 23 Group Shots of Chucks Pile of seasonal chucks, including pumplin, apple green, taupe, and caribbean blue. 24 Group Shots of Chucks Pile of high top chucks, including monochrome black, black, sky blue, grey, taupe, banana yellow, and pine green. 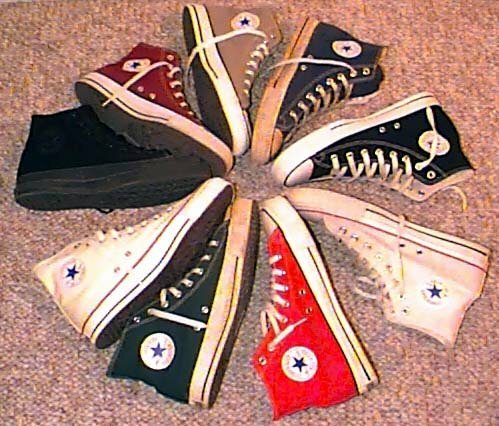 25 Group Shots of Chucks Pile of high top chucks, including black, monochrome balck, white, yellow, green, orange, red, and light blue. 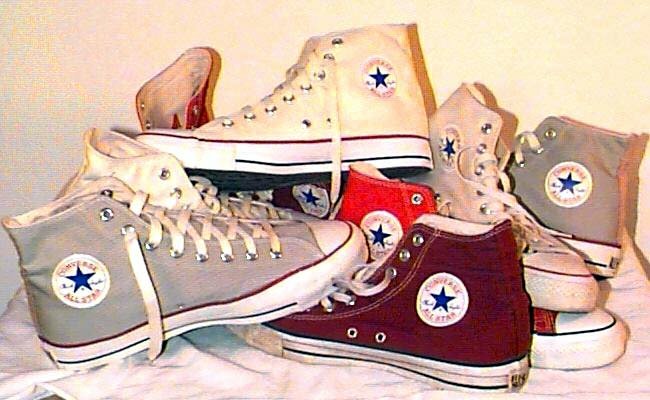 26 Group Shots of Chucks Pile of grey, natural white, maroon, and orange high top chucks. 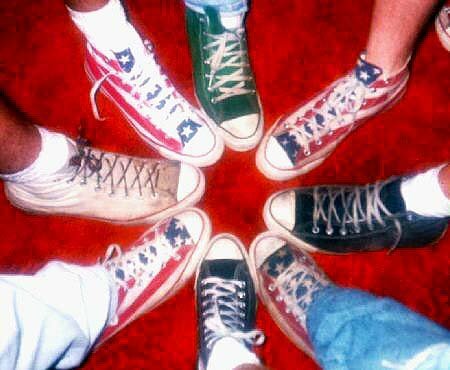 27 Group Shots of Chucks Photo of four Chuck Taylor shoes including an optical white high top, a stars and bars high top, a black low cut, and a red low cut. 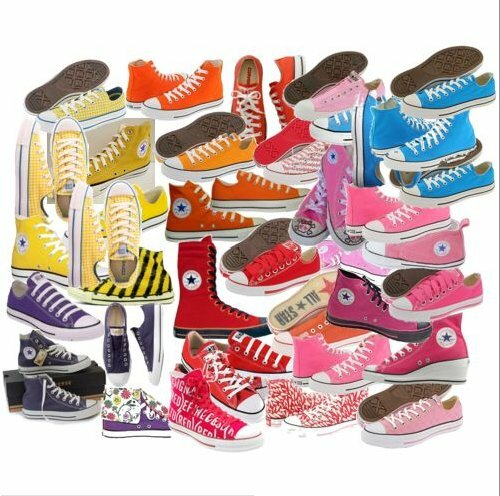 28 Group Shots of Chucks Four pairs of high top chucks: black, black/pink 2-tone, red, and neon pink/green All Star print. 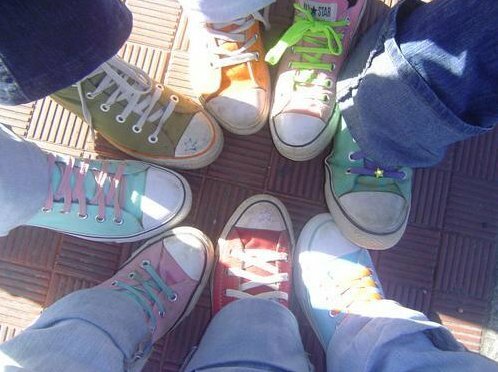 29 Group Shots of Chucks Friendly pairs of chucks. 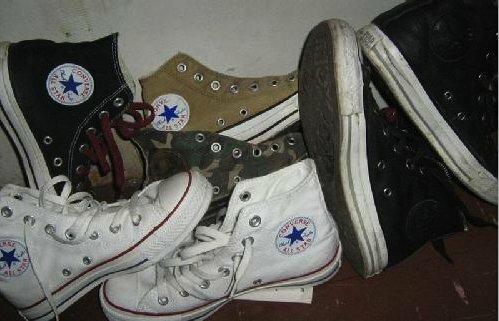 30 Group Shots of Chucks A collection of red, white, pink, monochrome black, and brown high top chucks. 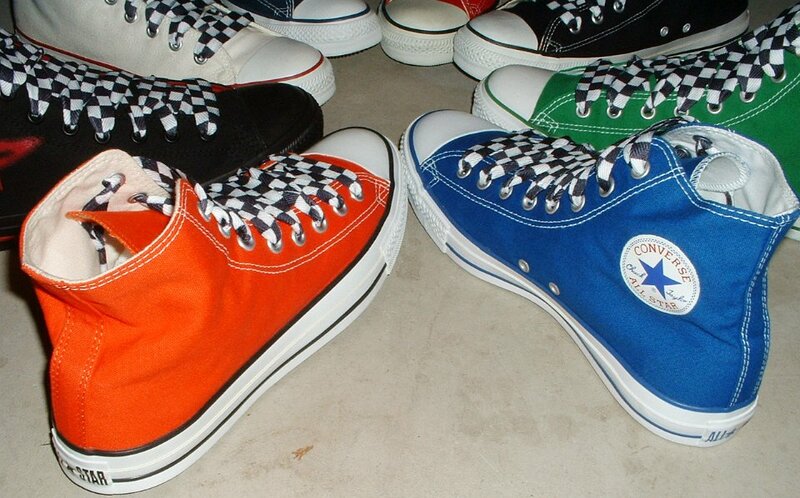 31 Group Shots of Chucks Optical white, black, taupe, and green camouflage high top chucks. 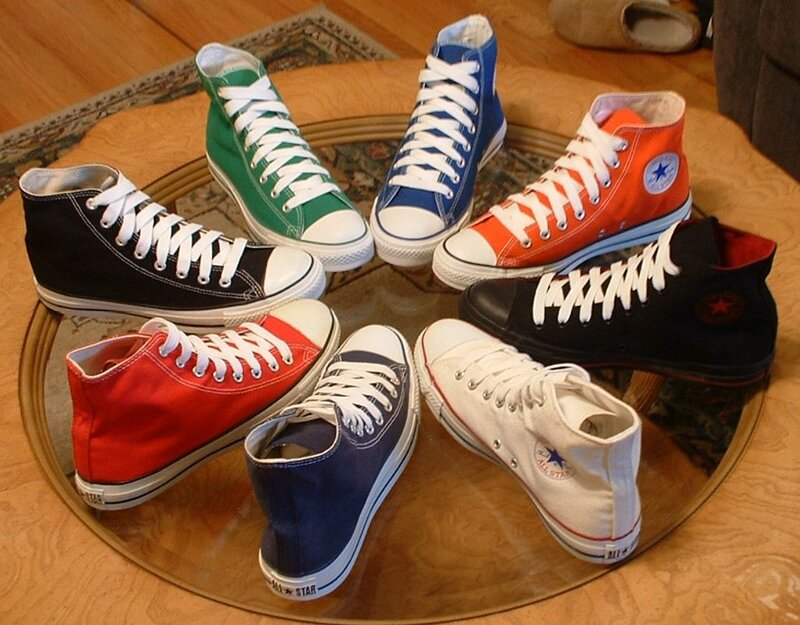 32 Group Shots of Chucks Assorted bunch of high top and foldover chucks. 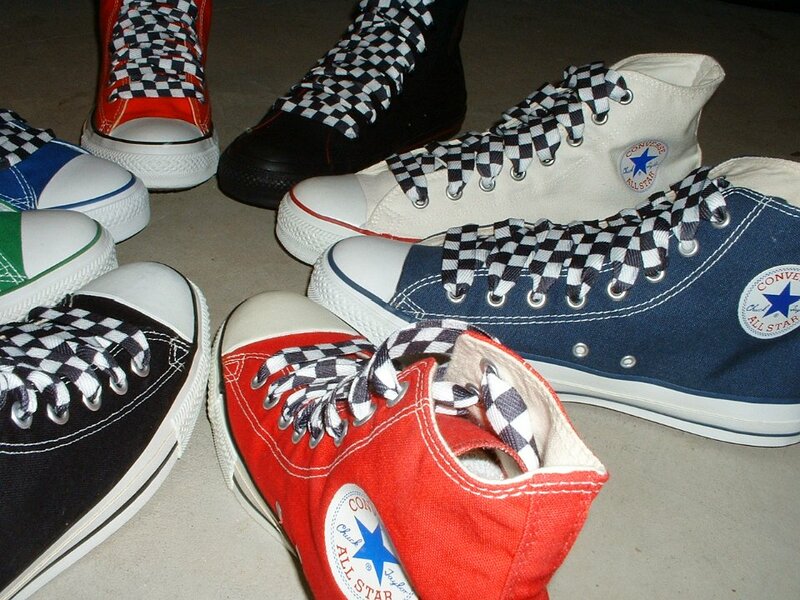 33 Group Shots of Chucks Wheel of high top chucks with black and white checkered shoelaces. 34 Group Shots of Chucks Close up shot of various high top Chuck Taylor shoes with black and white checkered shoelaces, shot 1. 35 Group Shots of Chucks Close up shot of various high top Chuck Taylor shoes with black and white checkered shoelaces, shot 2. 36 Group Shots of Chucks Close up shot of various high top Chuck Taylor shoes with black and white checkered shoelaces, shot 3. 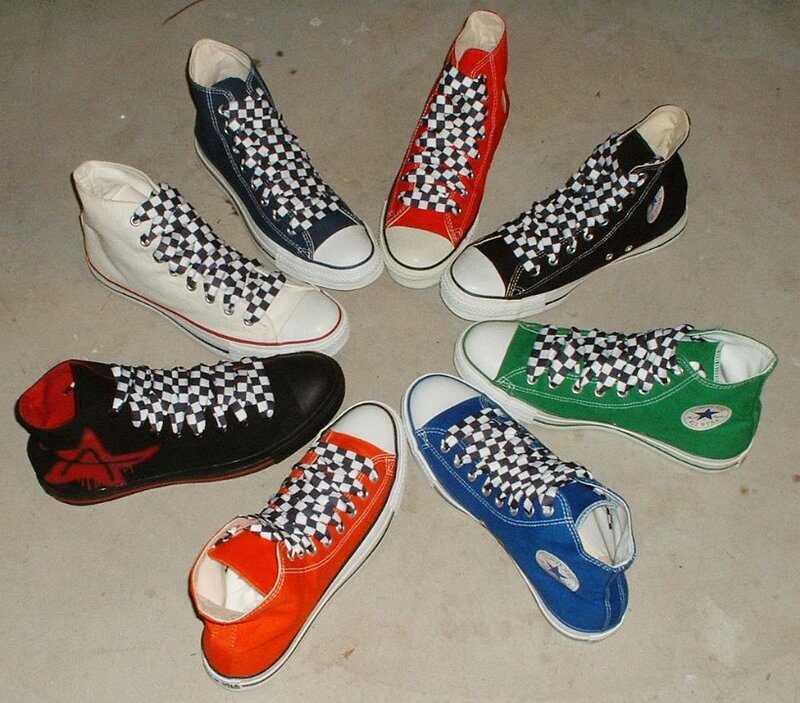 37 Group Shots of Chucks Wheel of high top chucks with black and white checkered shoelaces, shot 2. 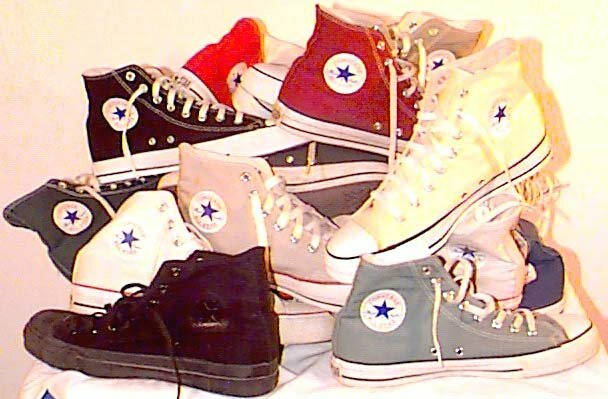 38 Group Shots of Chucks A front row of high top chucks. 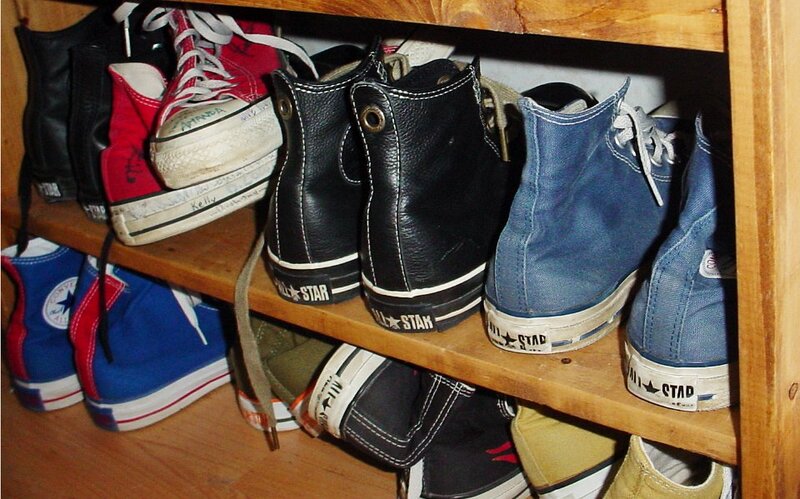 39 Group Shots of Chucks A teenager's collection of high top chucks. 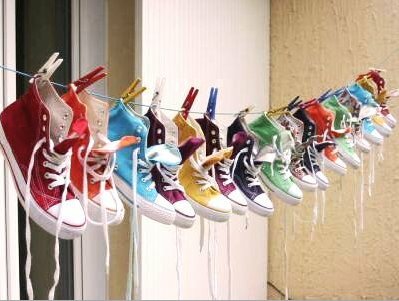 40 Group Shots of Chucks A collection of chucks hanging out. 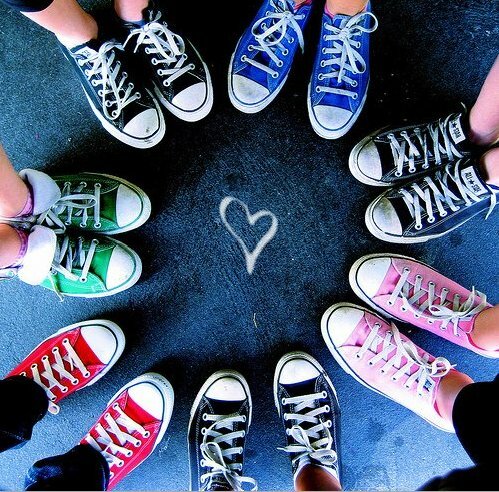 41 Group Shots of Chucks Circle of tween girls who love their chucks. 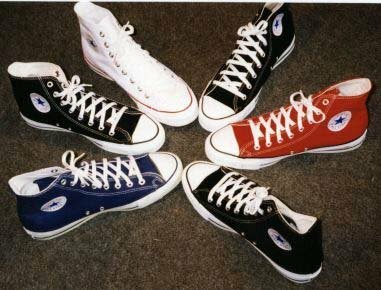 42 Group Shots of Chucks Circle of red, white, and black pairs of high top chucks. 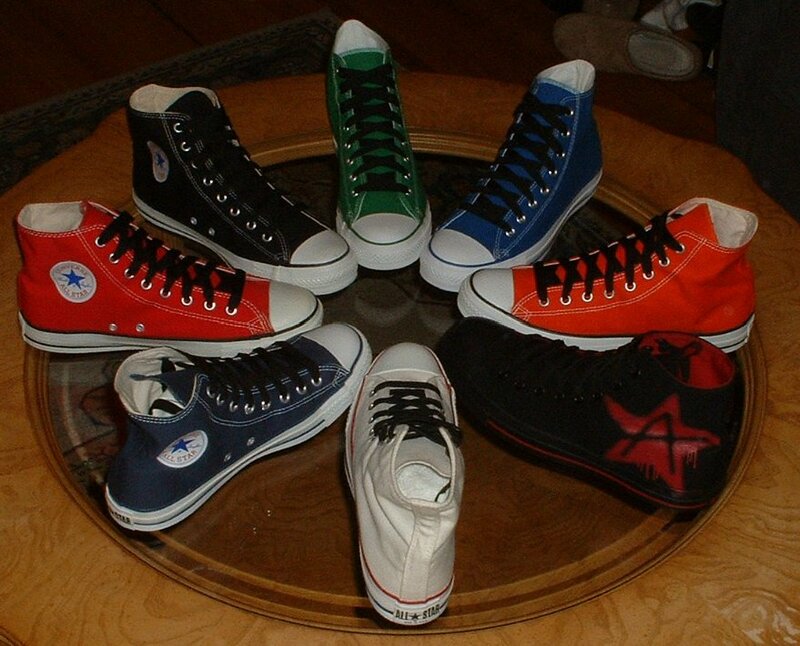 43 Group Shots of Chucks Six pairs of high top chucks in a circle, including 3 black, 1 blue, 1 optical white, and 1 red. 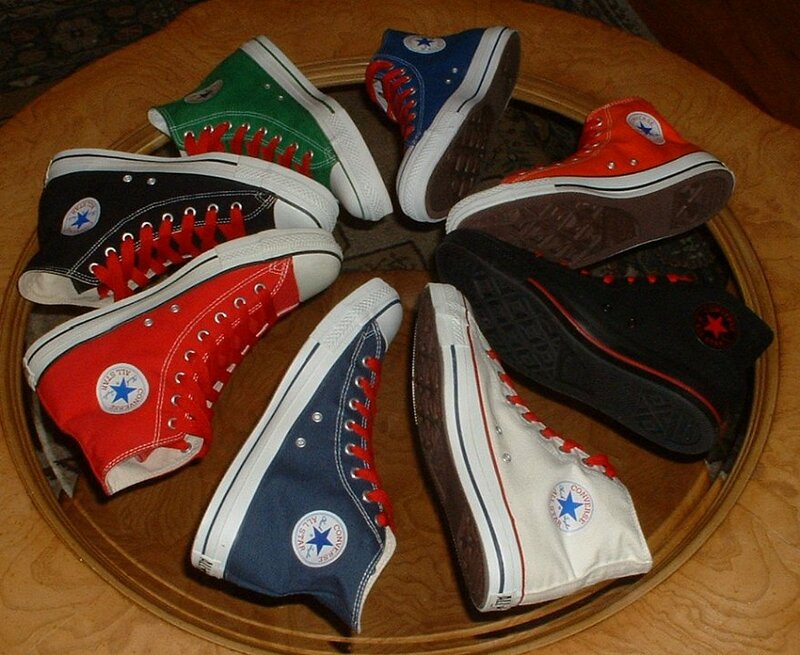 44 Group Shots of Chucks Top view of a circle of single high top chucks, in black, blue, optical white, and red. 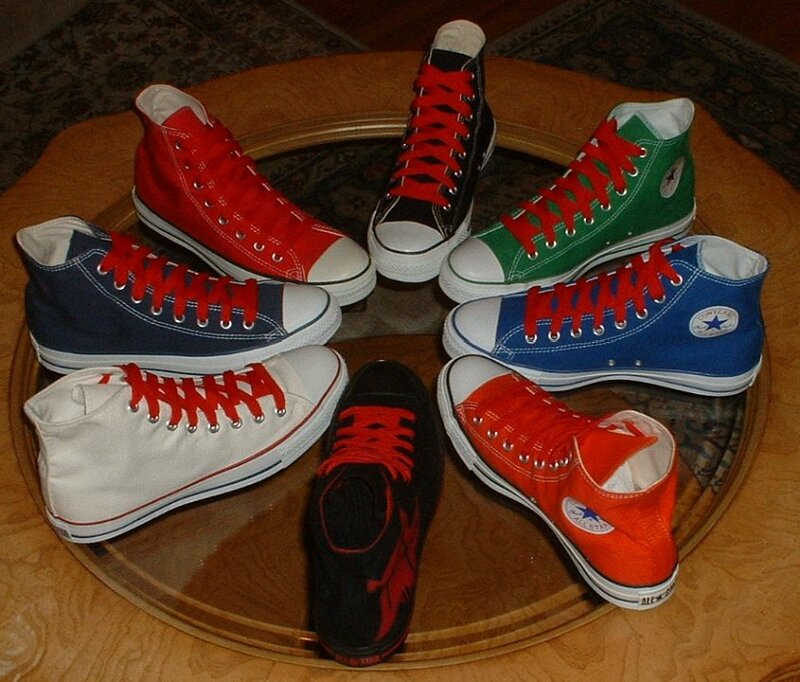 45 Group Shots of Chucks Circle of orange, yellow, flourescent green, and red high tops chucks. 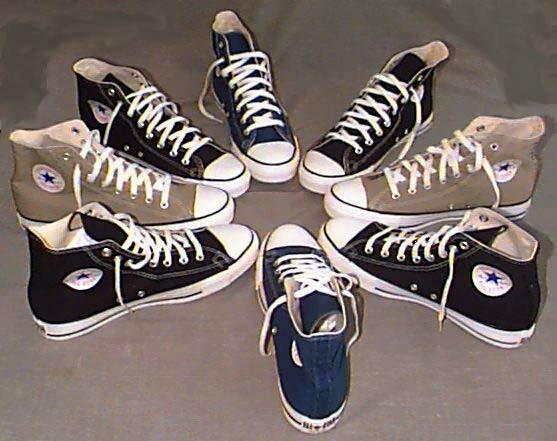 46 Group Shots of Chucks Circle of caribbean blue and taupe high top chucks. 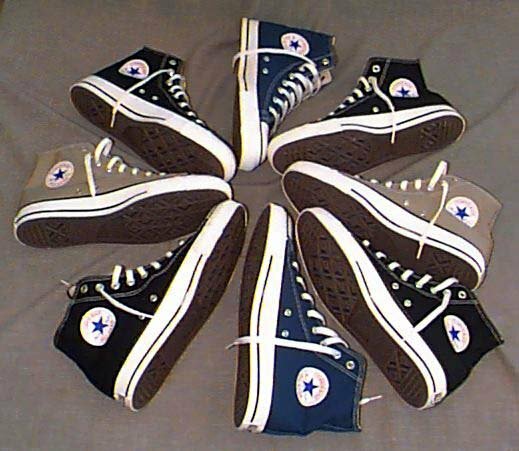 47 Group Shots of Chucks Circle of black, blue, and light brown high top chucks. 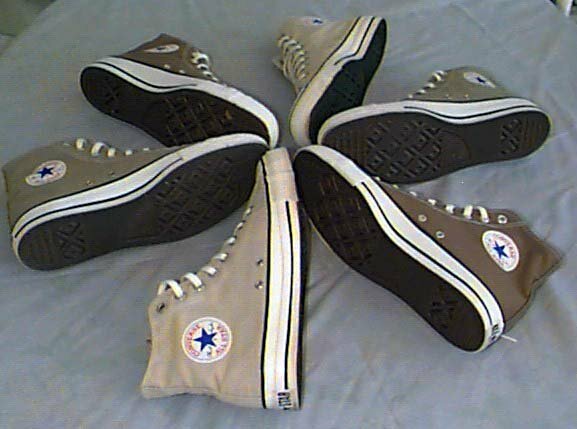 48 Group Shots of Chucks Circle of several shades of brown chuck high tops. 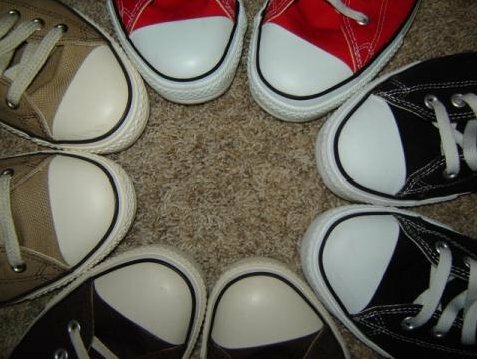 49 Group Shots of Chucks Circle of black high top, red, and brown kneehi chucks. 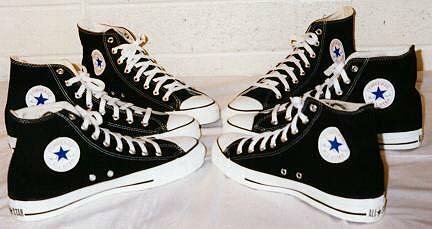 50 Group Shots of Chucks Quartet of black high top and low cut chucks. 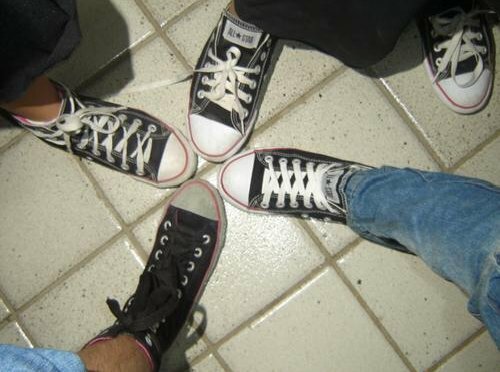 51 Group Shots of Chucks Circle of chucks, many sporting black shoelaces. 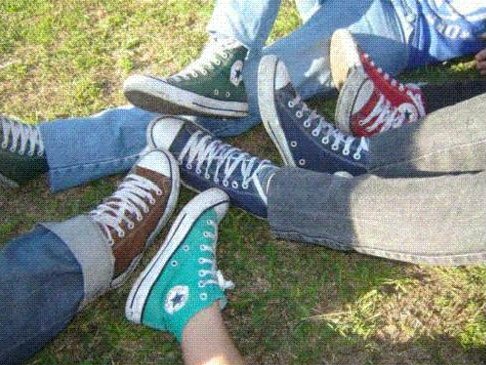 52 Group Shots of Chucks Circle of kids wearing print upper chucks. 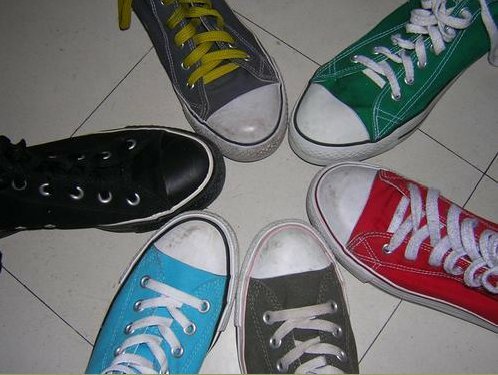 53 Group Shots of Chucks Circle of five chucks wearers. 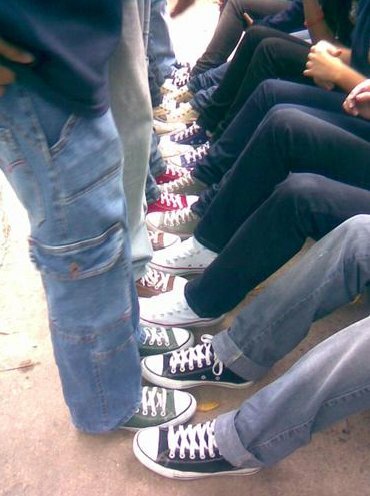 54 Group Shots of Chucks Circle of low cut chucks. 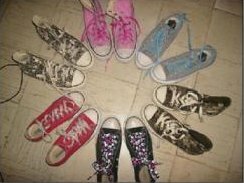 55 Group Shots of Chucks Kids circle of chucks. 56 Group Shots of Chucks Girls wearing various bright colored pairs of chucks. 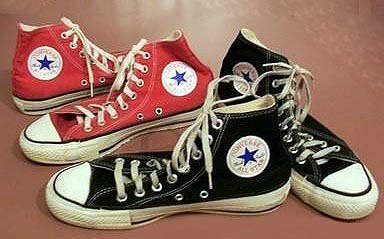 57 Group Shots of Chucks Collection of black, red and grey high top chucks, some with print shoelaces. 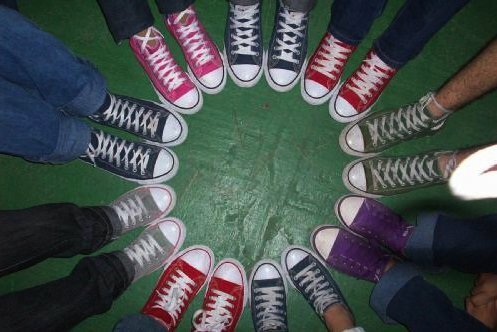 58 Group Shots of Chucks Circle of foldover chucks. 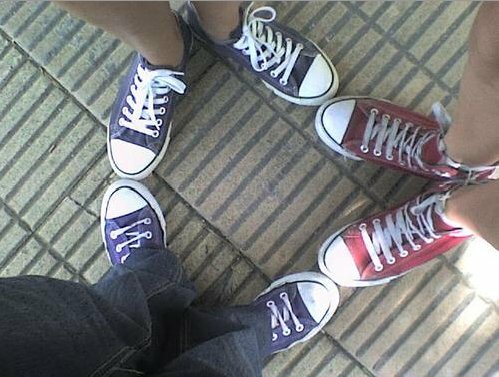 59 Group Shots of Chucks Triangle of navy blue, purple, and red high top chucks. 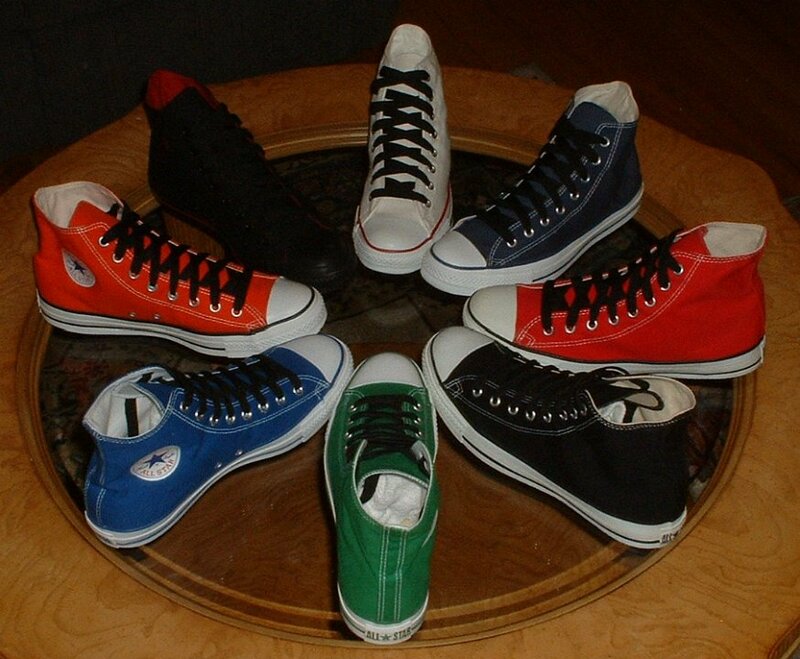 60 Group Shots of Chucks Circle of nine pairs of high top chucks. 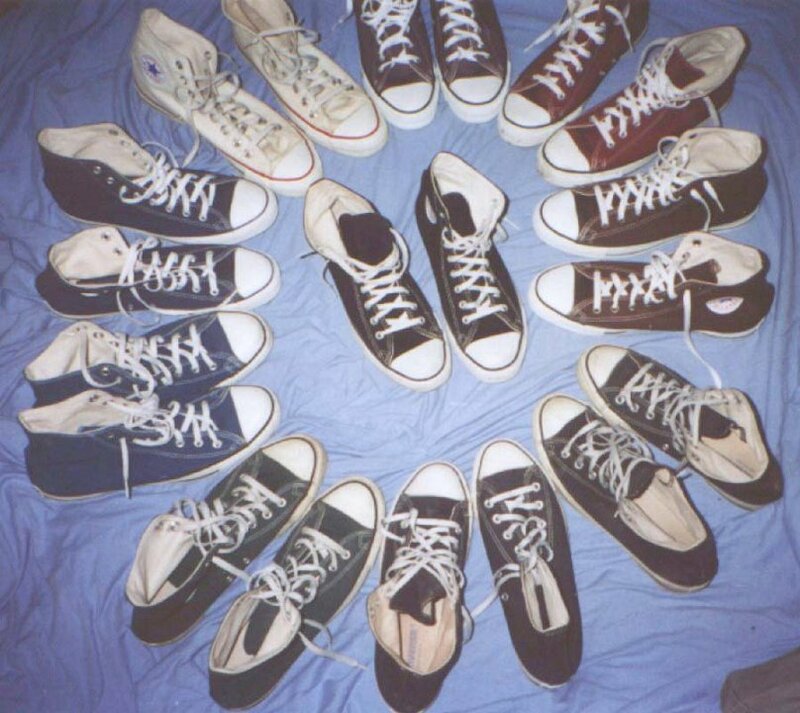 61 Group Shots of Chucks Circle of chucks with alternate shoelaces. 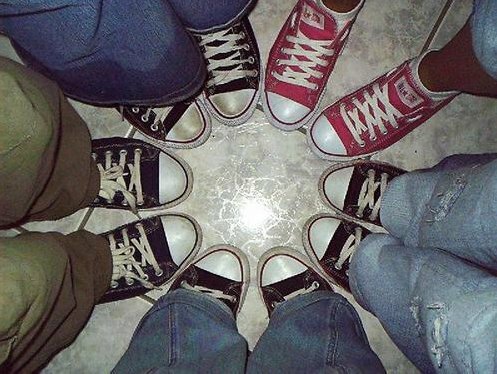 62 Group Shots of Chucks Circle of toe caps. 63 Group Shots of Chucks Collage of chucks. 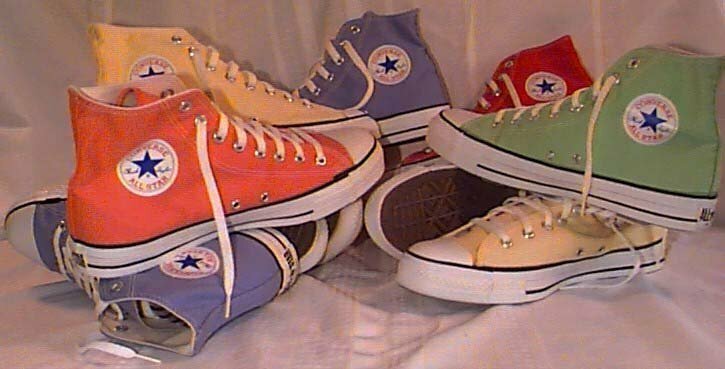 64 Group Shots of Chucks Collection of light pastel colored chucks. 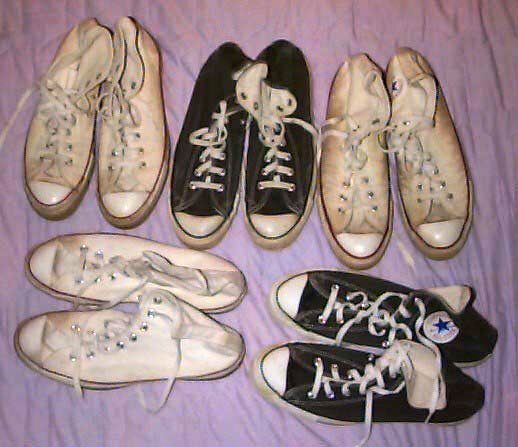 65 Group Shots of Chucks Collection of worn black, natural, and optical white high top chucks. 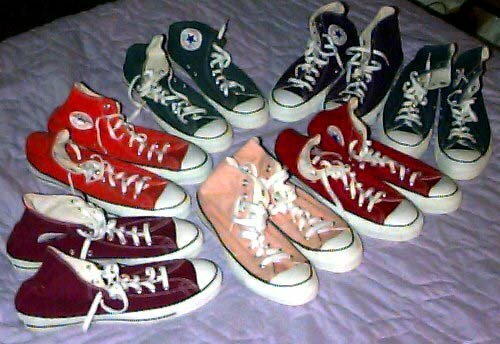 66 Group Shots of Chucks Collection of high top chucks. 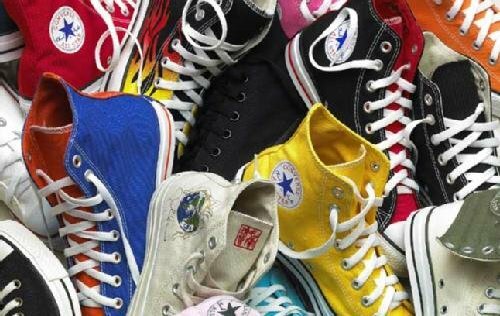 67 Group Shots of Chucks Large collection of high top chucks. 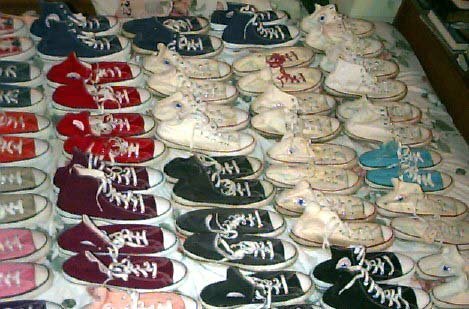 68 Group Shots of Chucks Collection of high top chucks. 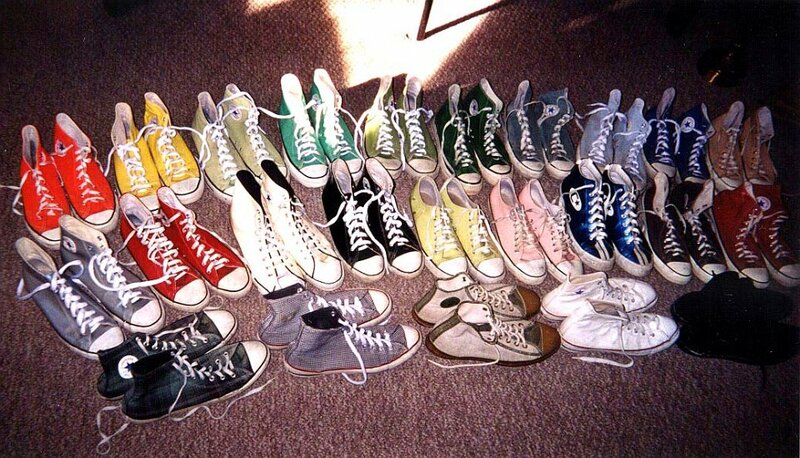 69 Group Shots of Chucks Large collection of chucks. 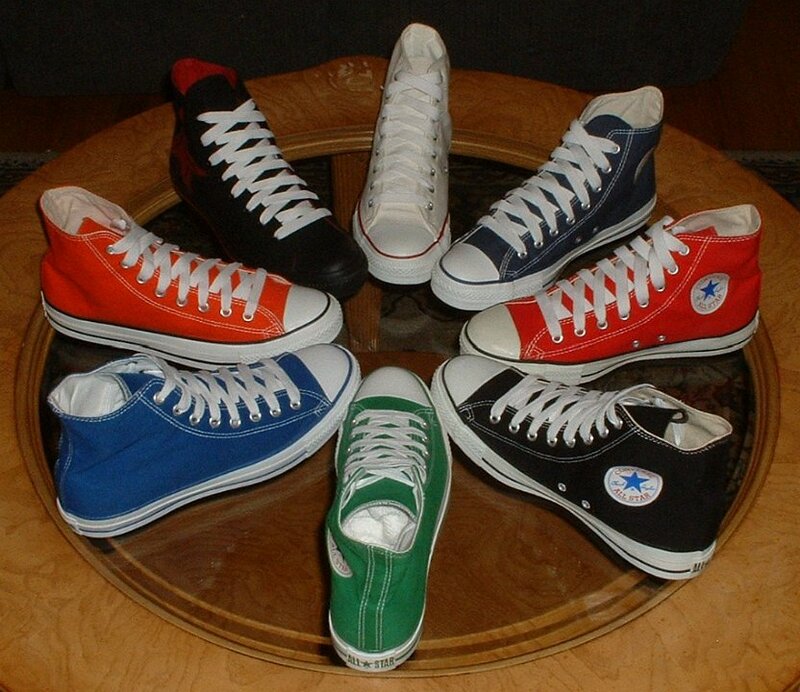 70 Group Shots of Chucks High top chucks of all colors. 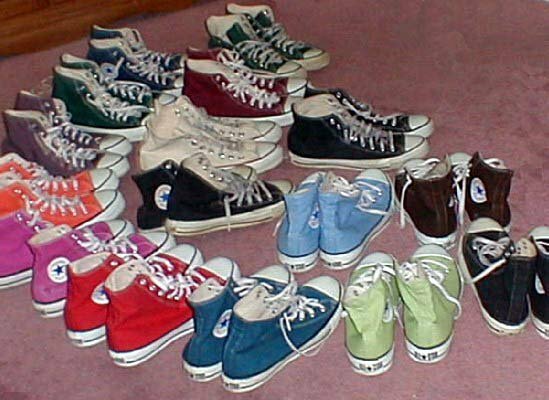 71 Group Shots of Chucks Reverse view of the collection. 72 Group Shots of Chucks The chucks club. 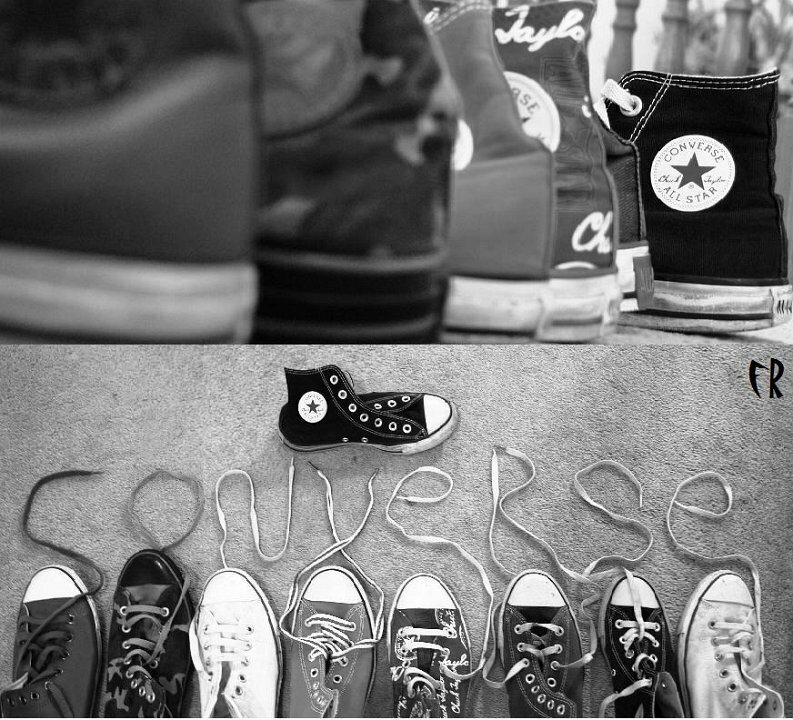 73 Group Shots of Chucks Student black and white collage of chucks. 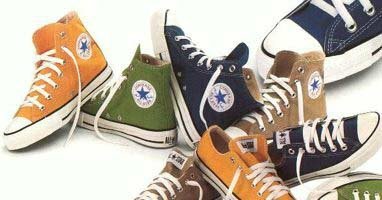 74 Group Shots of Chucks Catalog shots of seasonal oxford chucks. 75 Group Shots of Chucks Wearing black and purple chucks. 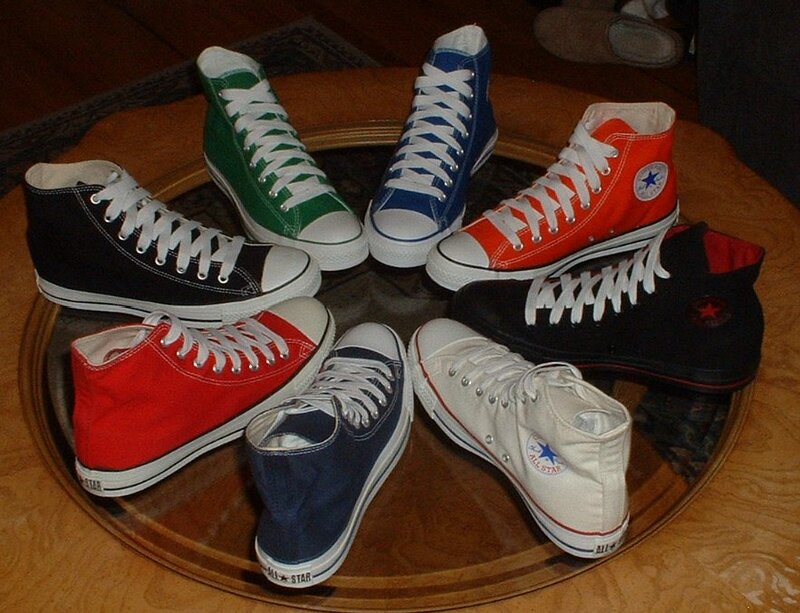 76 Group Shots of Chucks Circle of high top chucks wearers. 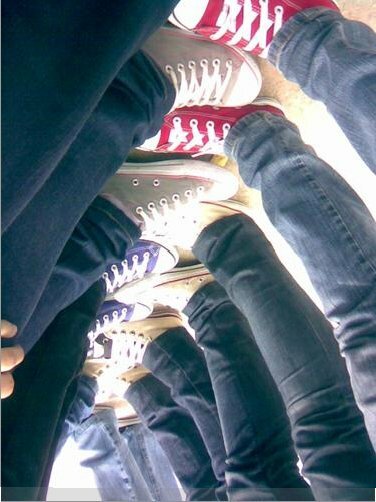 77 Group Shots of Chucks Wearing blue and brown chucks. 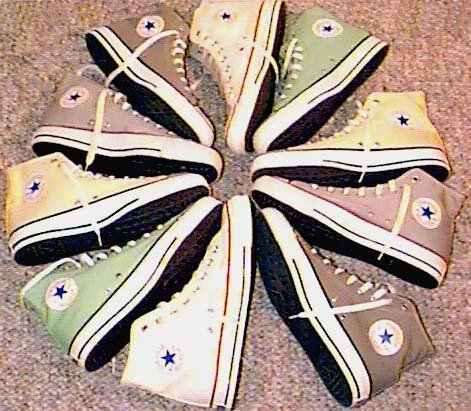 79 Group Shots of Chucks Interlocking chucks, shot 2. 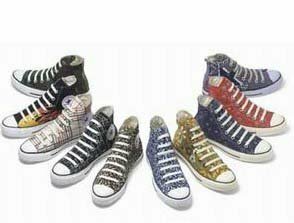 80 Group Shots of Chucks Half circle of high top chucks with various canvas patterns. 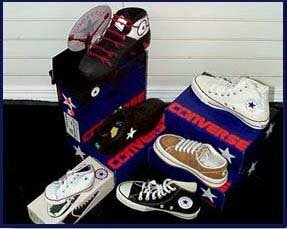 81 Group Shots of Chucks Chucks that catch your eye on top of their boxes. 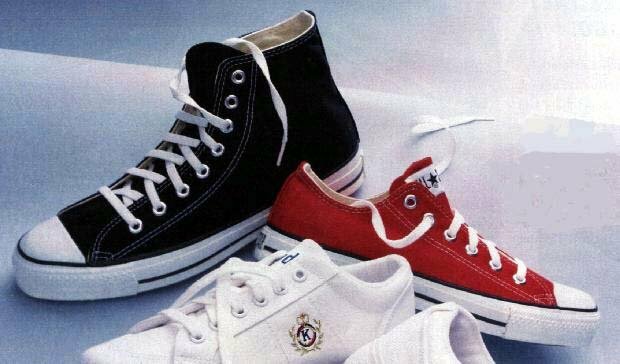 82 Group Shots of Chucks White, black, and red high top chucks with skinny jeans. 83 Group Shots of Chucks Chucks on a fence rail. 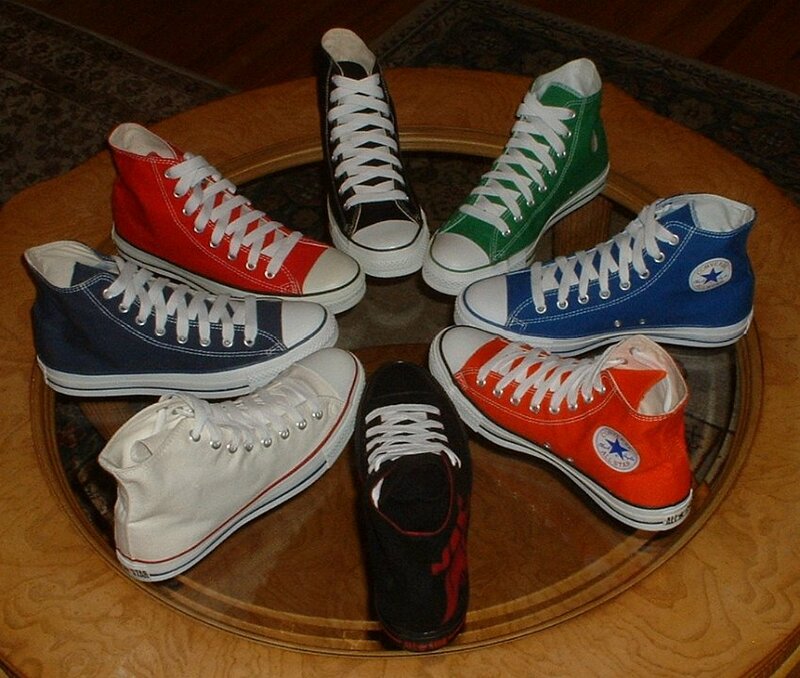 84 Group Shots of Chucks Circle of chucks. 85 Group Shots of Chucks Chucks on a rail, rear view. 86 Group Shots of Chucks Chucks on a rail, side view. 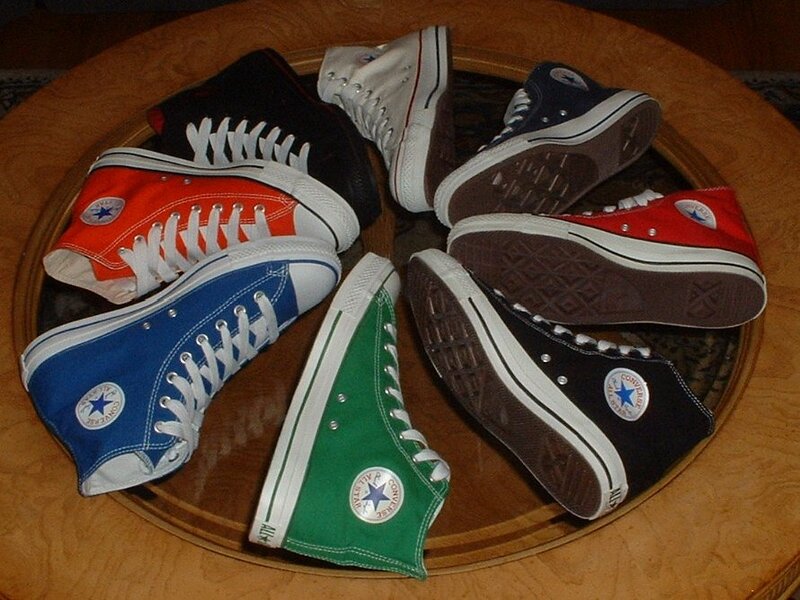 87 Group Shots of Chucks Circle of chucks, shot 2. 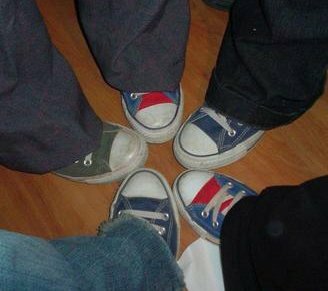 88 Group Shots of Chucks Circle of toecaps. 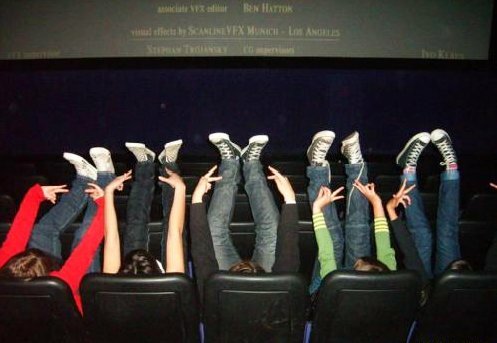 89 Group Shots of Chucks Four girls showing off their high top chucks. 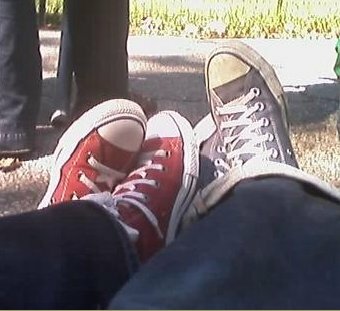 90 Group Shots of Chucks Wearing grey and red high top chucks. 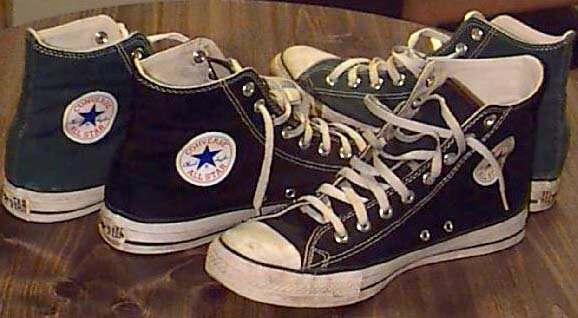 91 Group Shots of Chucks Green and black high top and optical white oxford chucks. 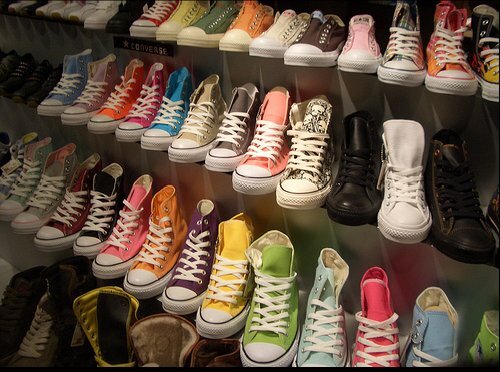 92 Group Shots of Chucks Collection of chucks. 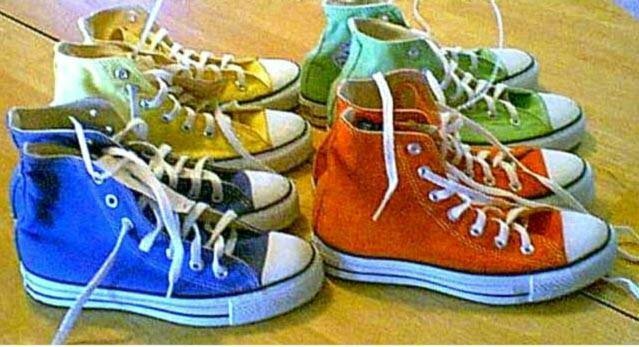 93 Group Shots of Chucks Banana yellow and fluorescent green high tops. 94 Group Shots of Chucks Kids sporting black, optical white, and monochrome black chucks. 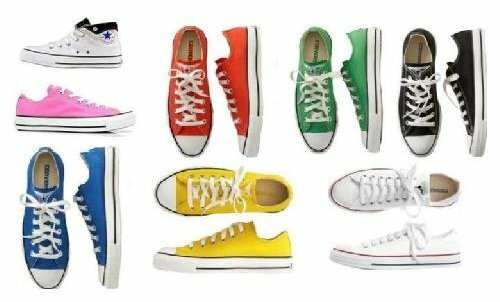 95 Group Shots of Chucks Green, black and pink low cut chucks. 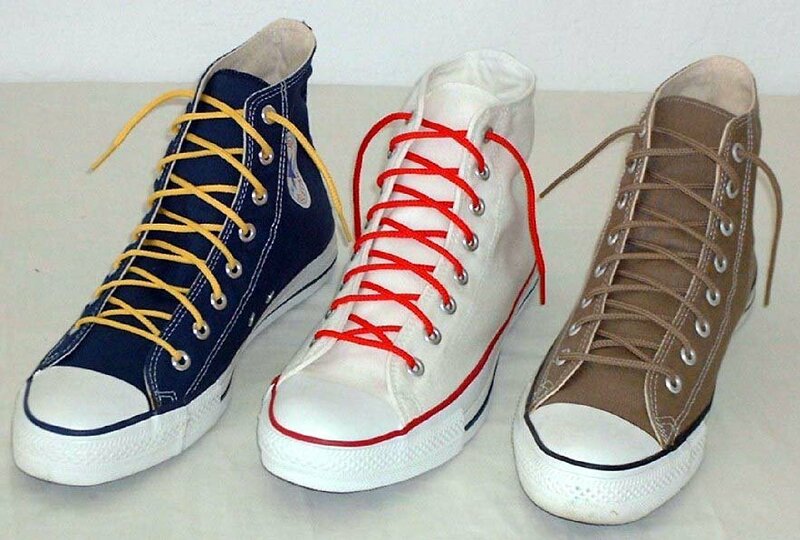 96 Group Shots of Chucks High top chucks with narrow laces. 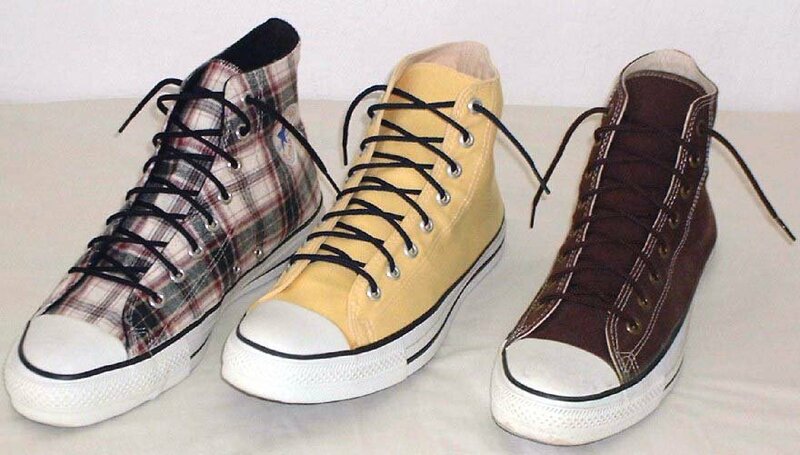 97 Group Shots of Chucks Plaid, yellow, and brown high tops with narrow laces. 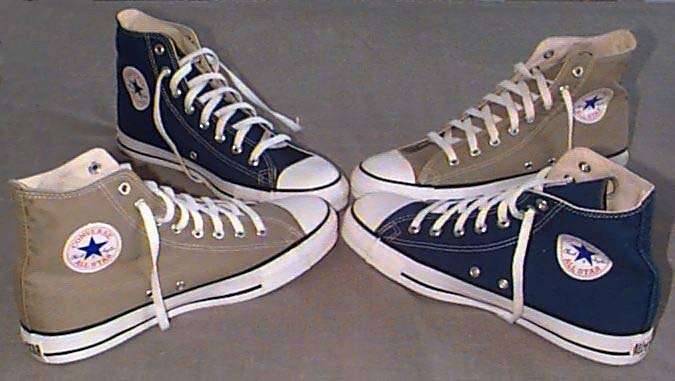 98 Group Shots of Chucks Navy blue, optical whie, and tan chucks with narrow laces. 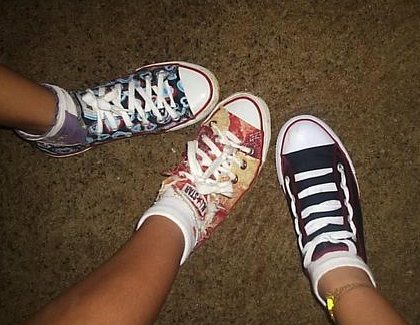 99 Group Shots of Chucks Optical white, huckleberry blue, and chocolate brown high tops with narrow laces. 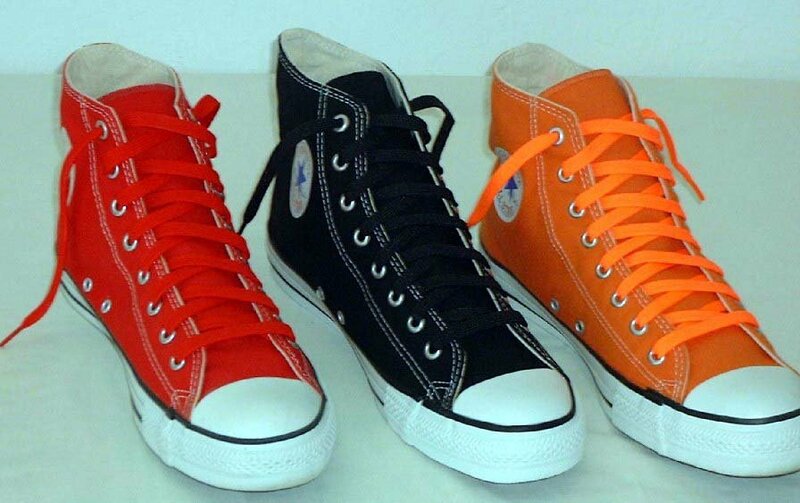 100 Group Shots of Chucks Red, black, and orange high tops with red, black and neon orange laces. 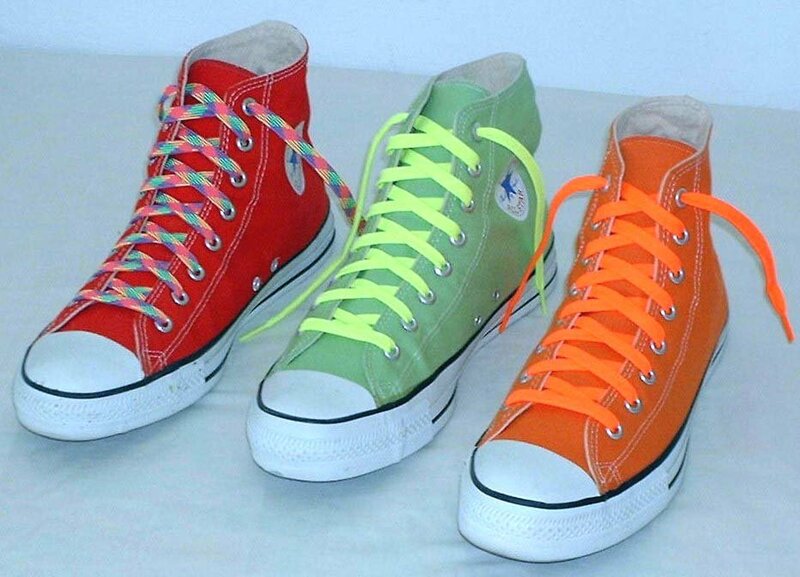 101 Group Shots of Chucks High top chucks with neon laces. 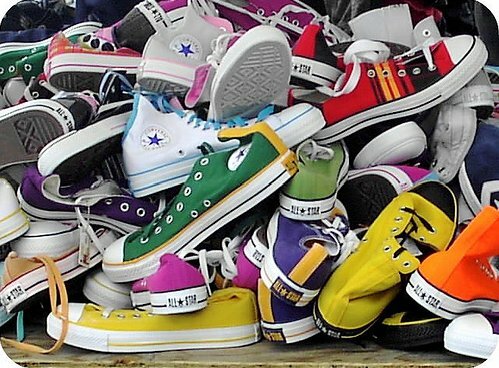 102 Group Shots of Chucks Pile of chucks. 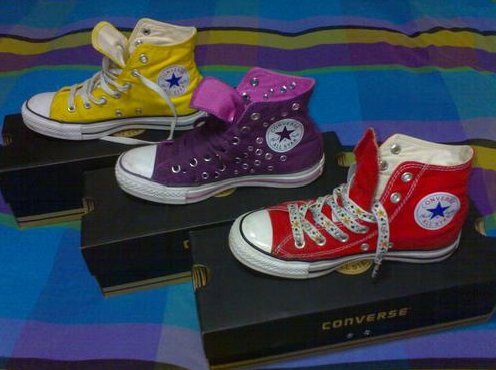 103 Group Shots of Chucks Red and purple chucks. 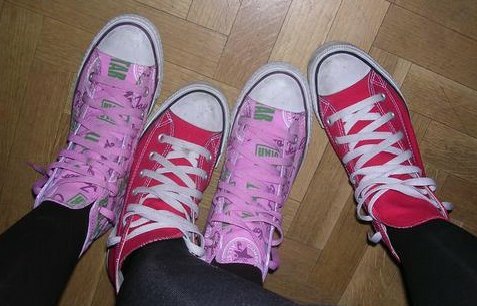 104 Group Shots of Chucks Red and pink print high top chucks. 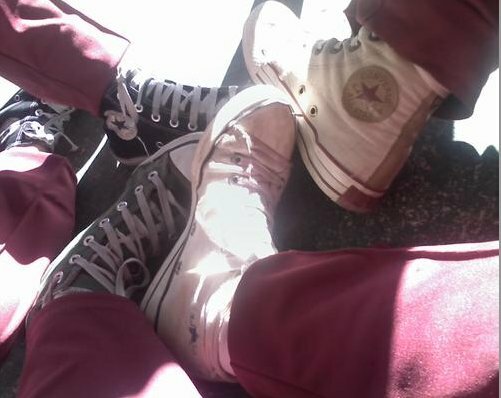 105 Group Shots of Chucks Maroon and red high top chucks. 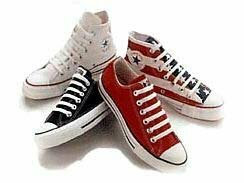 106 Group Shots of Chucks Black high top and red low cut chuck with white leather tennis shoes. 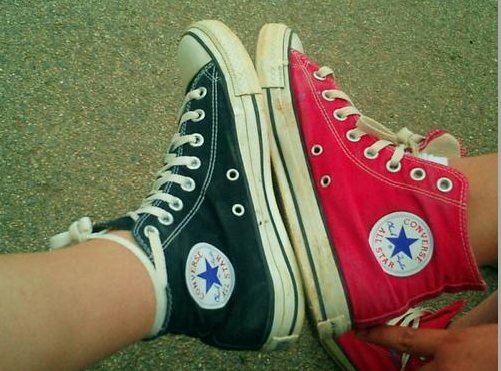 107 Group Shots of Chucks Vintage black and red high tops. 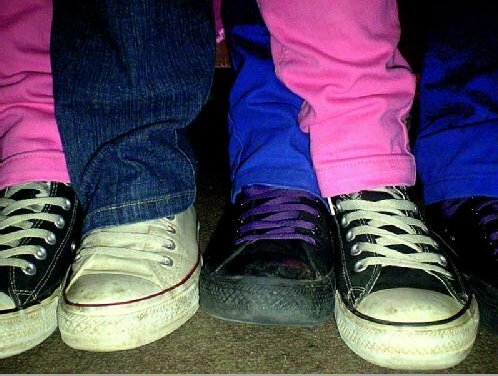 108 Group Shots of Chucks Kids showing off their purple, red, and optical white chucks. 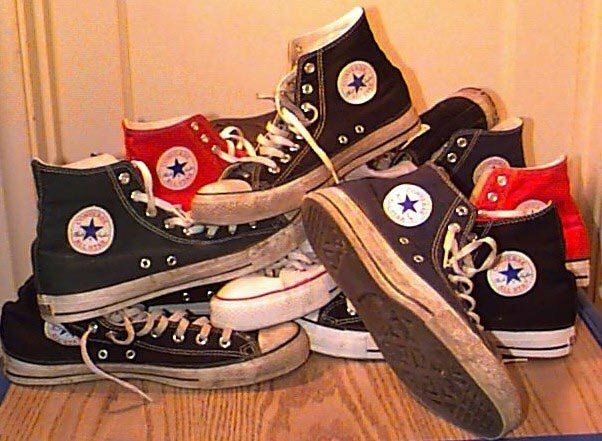 109 Group Shots of Chucks Core and seasonal high top chucks with black retro shoelaces, shot 1. 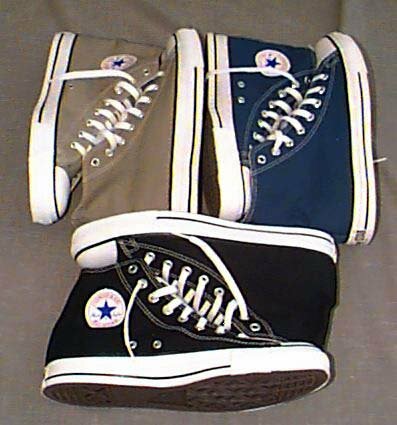 110 Group Shots of Chucks Core and seasonal high top chucks with black retro shoelaces, shot 2. 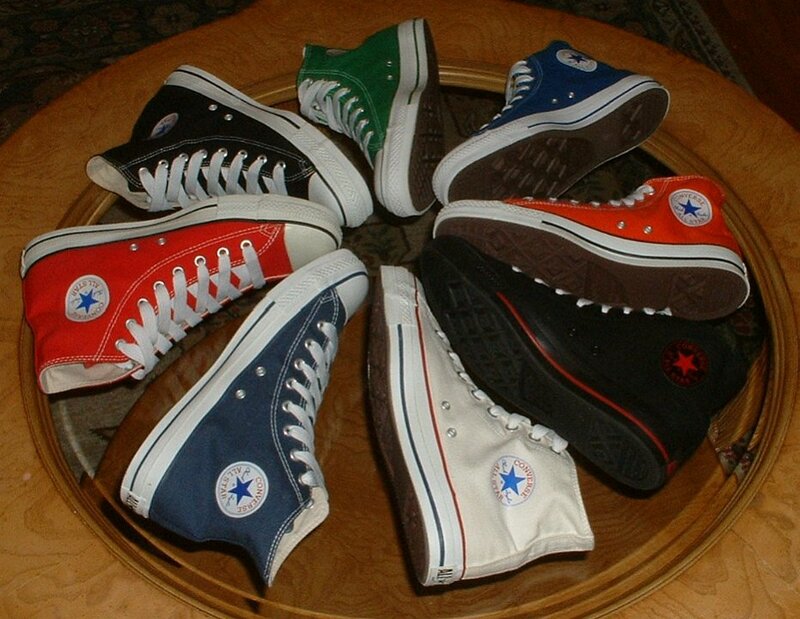 111 Group Shots of Chucks Core and seasonal high top chucks with black retro shoelaces, shot 3. 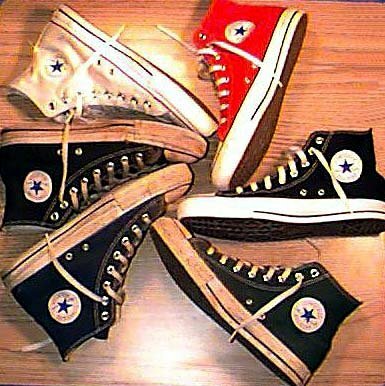 113 Group Shots of Chucks Core and seasonal high top chucks with black retro shoelaces, shot 5. 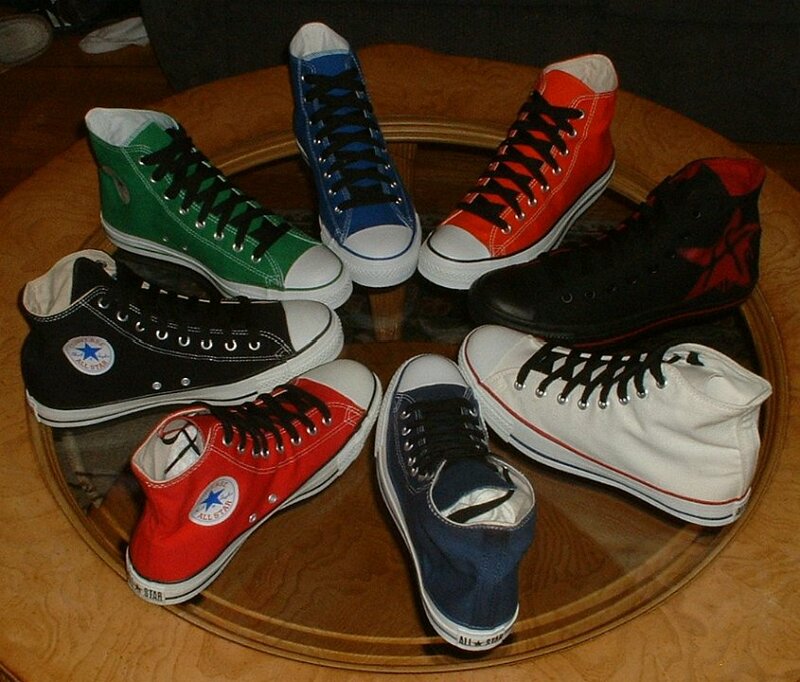 114 Group Shots of Chucks Core and seasonal high top chucks with black retro shoelaces, shot 6. 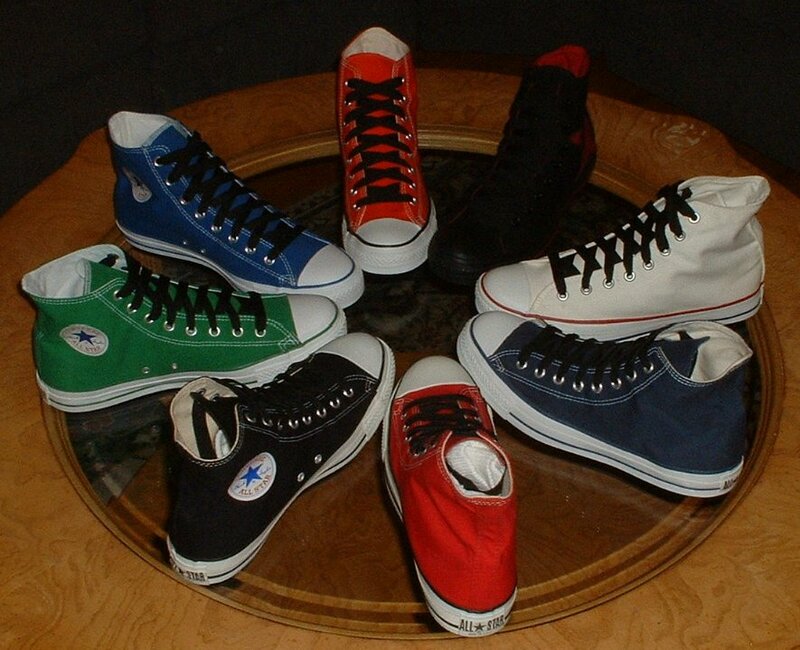 115 Group Shots of Chucks Core and seasonal high top chucks with black retro shoelaces, shot 7. 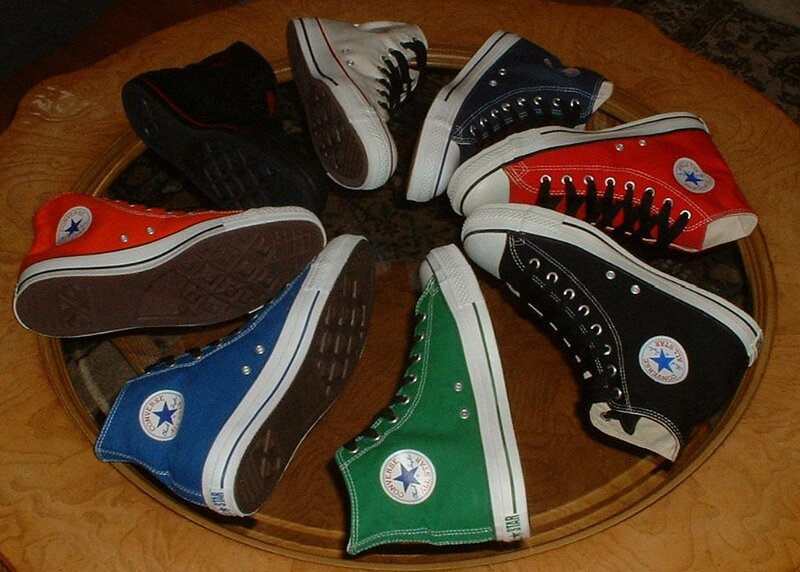 116 Group Shots of Chucks Core and seasonal high top chucks with black retro shoelaces, shot 8. 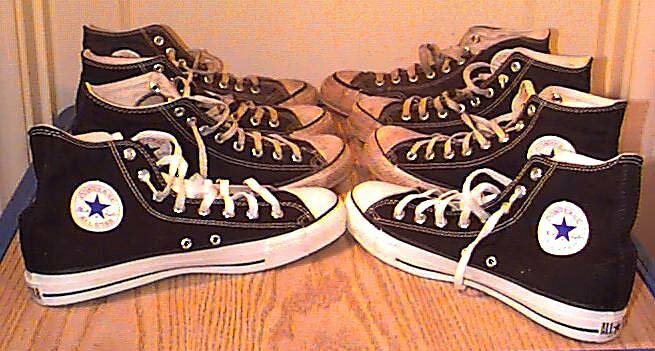 117 Group Shots of Chucks Core and seasonal high top chucks with black retro shoelaces, shot 9. 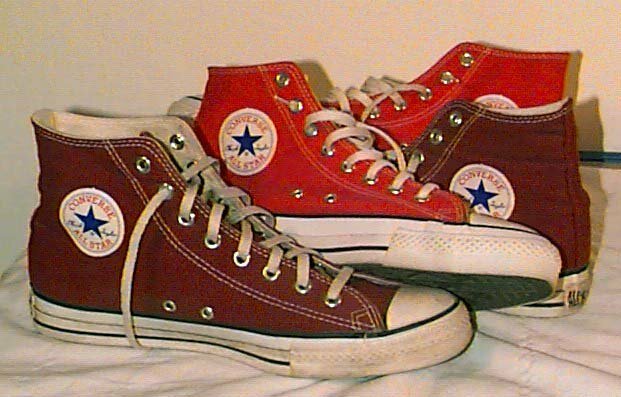 118 Group Shots of Chucks Core and seasonal high top chucks with red retro shoelaces, shot 1. 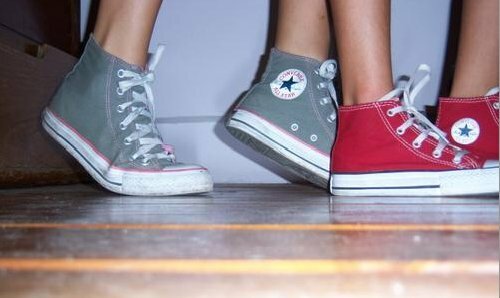 119 Group Shots of Chucks Core and seasonal high top chucks with red retro shoelaces, shot 2. 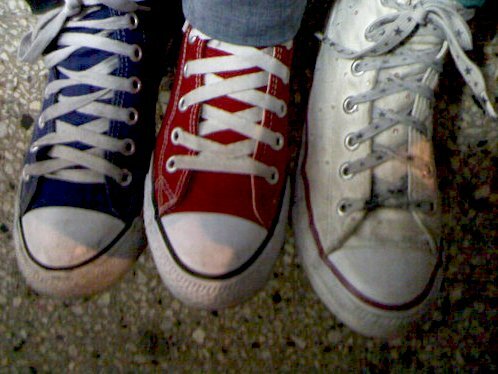 121 Group Shots of Chucks Core and seasonal high top chucks with red retro shoelaces, shot 4. 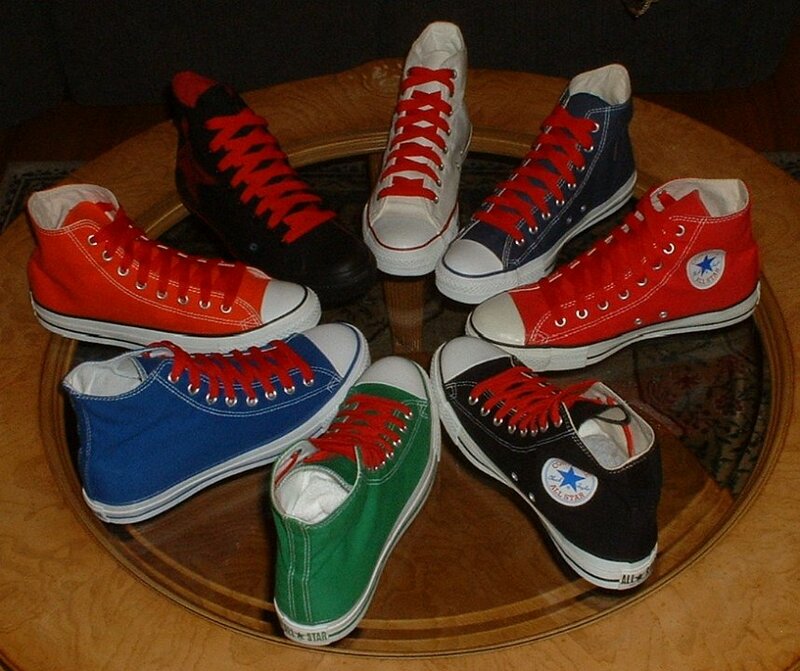 122 Group Shots of Chucks Core and seasonal high top chucks with red retro shoelaces, shot 5. 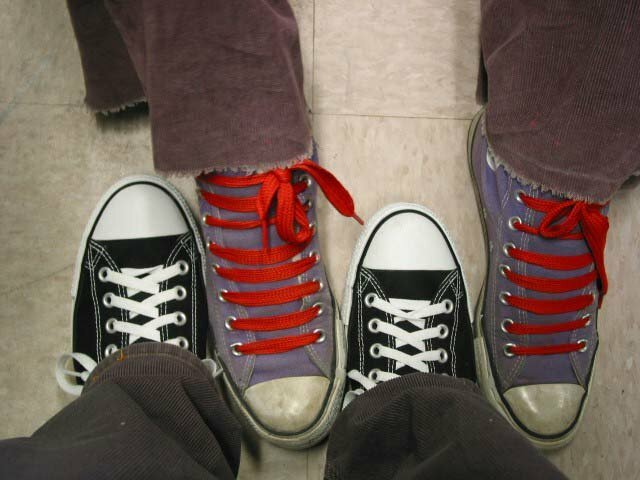 123 Group Shots of Chucks Core and seasonal high top chucks with red retro shoelaces, shot 6. 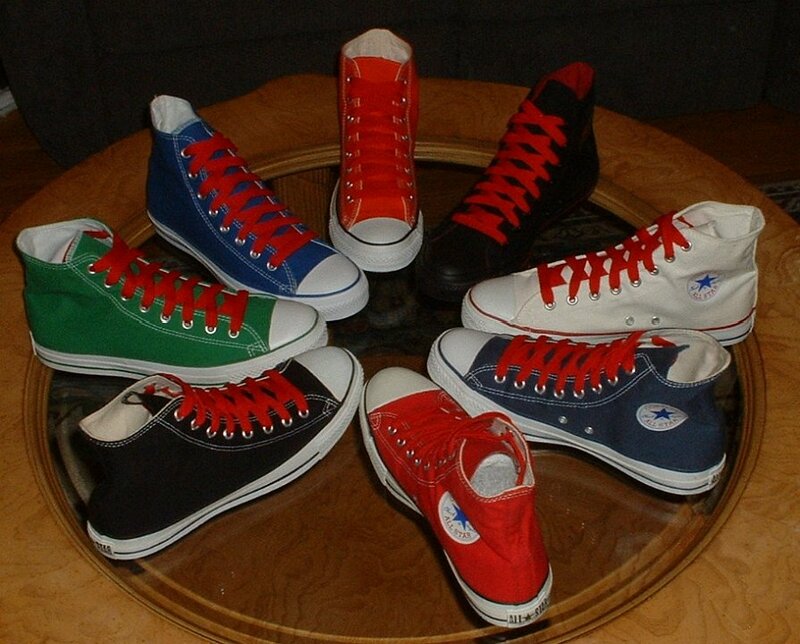 124 Group Shots of Chucks Core and seasonal high top chucks with red retro shoelaces, shot 7. 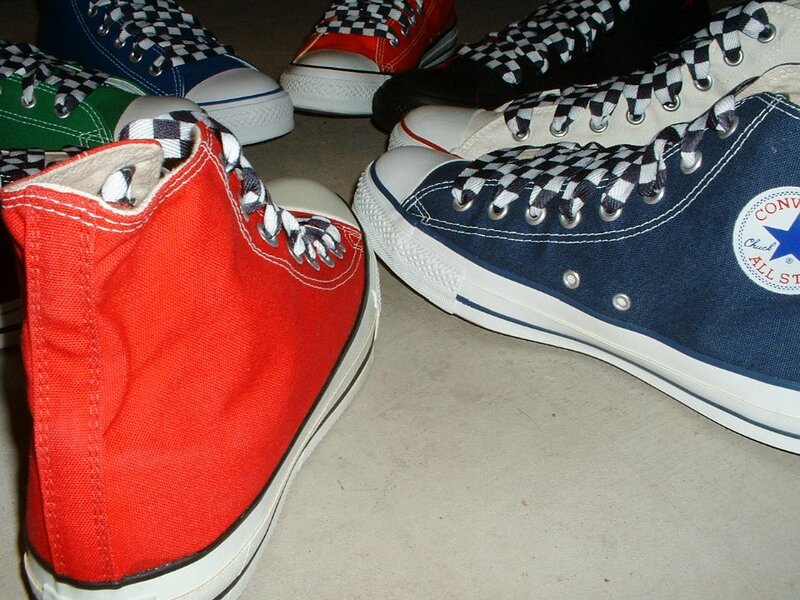 125 Group Shots of Chucks Core and seasonal high top chucks with red retro shoelaces, shot 8. 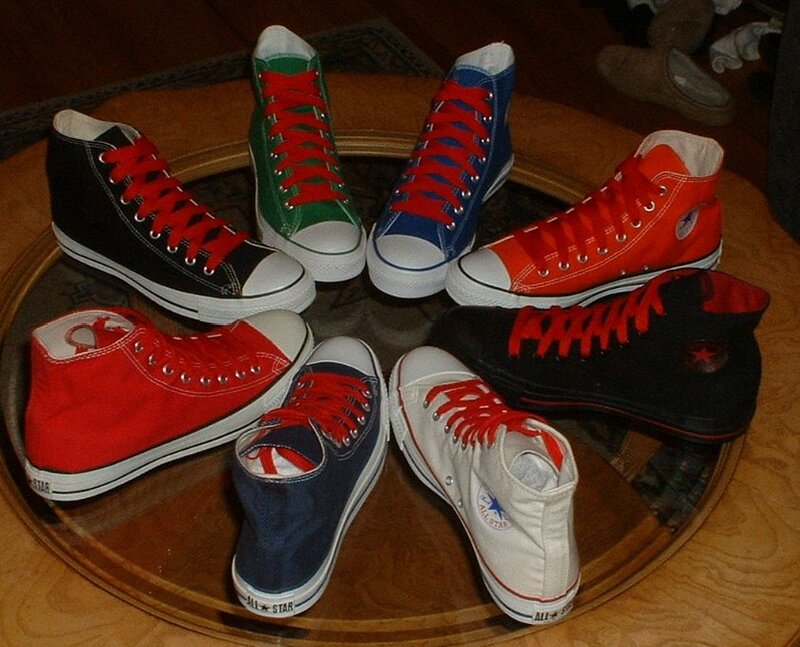 126 Group Shots of Chucks Core and seasonal high top chucks with red retro shoelaces, shot 9. 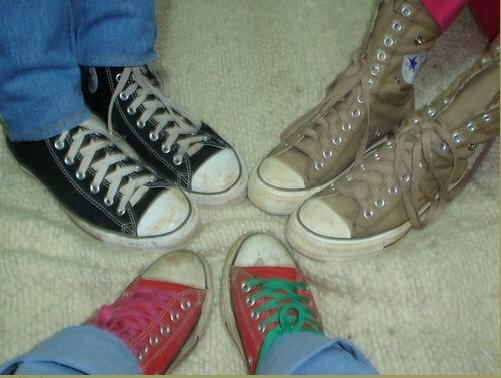 127 Group Shots of Chucks Core and seasonal high top chucks with red retro shoelaces, shot 10. 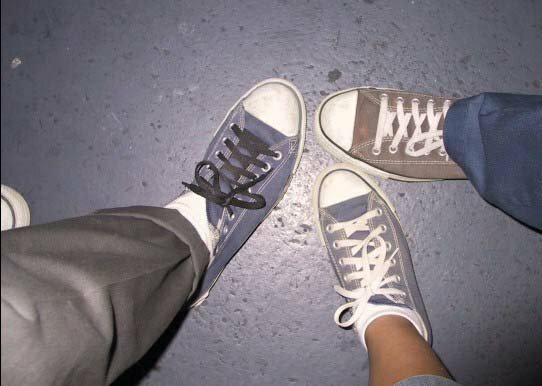 128 Group Shots of Chucks Core and seasonal high top chucks with white retro shoelaces, shot 1. 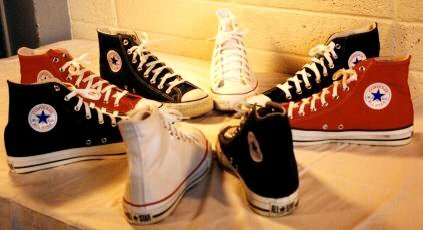 130 Group Shots of Chucks Core and seasonal high top chucks with white retro shoelaces, shot 3. 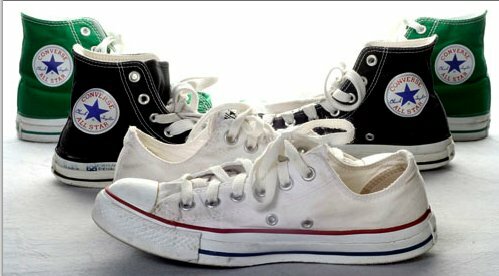 131 Group Shots of Chucks Core and seasonal high top chucks with white retro shoelaces, shot 4. 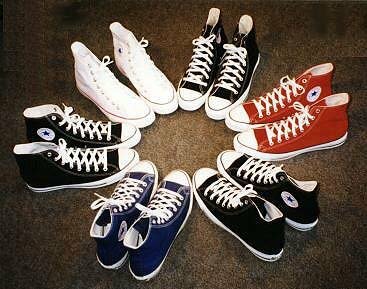 132 Group Shots of Chucks Core and seasonal high top chucks with white retro shoelaces, shot 5. 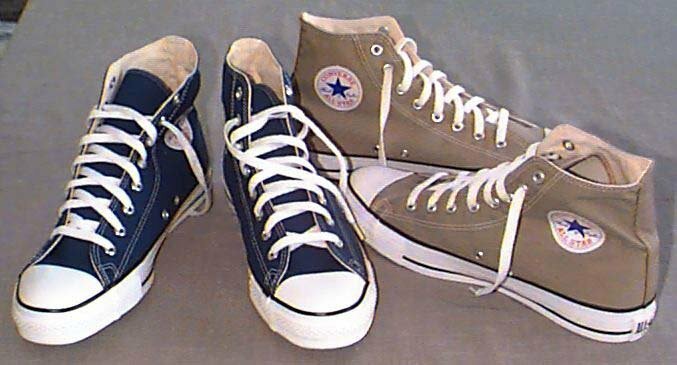 133 Group Shots of Chucks Core and seasonal high top chucks with white retro shoelaces, shot 6. 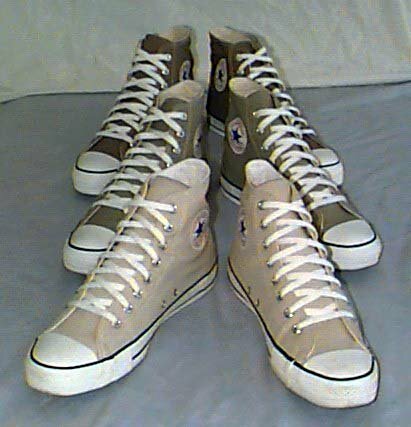 134 Group Shots of Chucks Core and seasonal high top chucks with white retro shoelaces, shot 7. 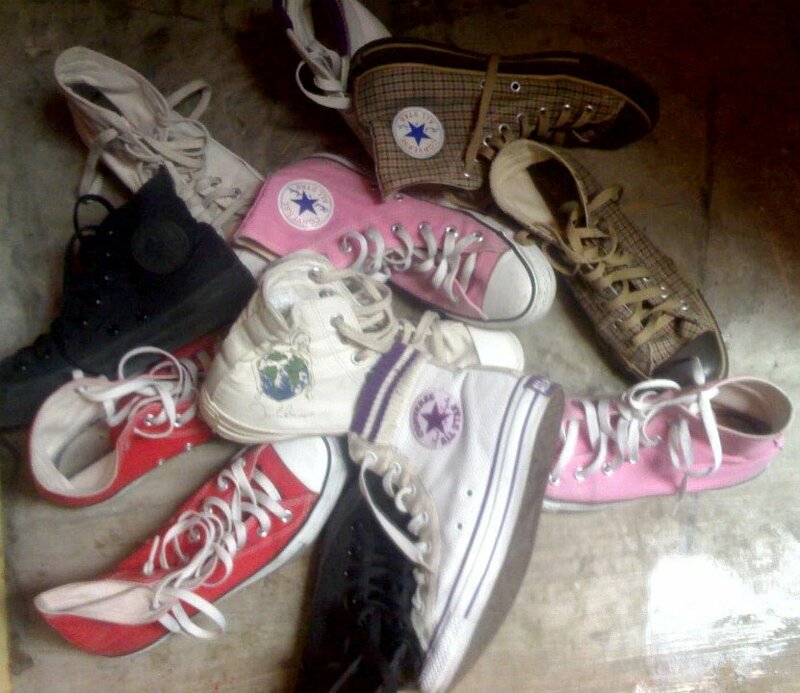 135 Group Shots of Chucks Core and seasonal high top chucks with white retro shoelaces, shot 8. 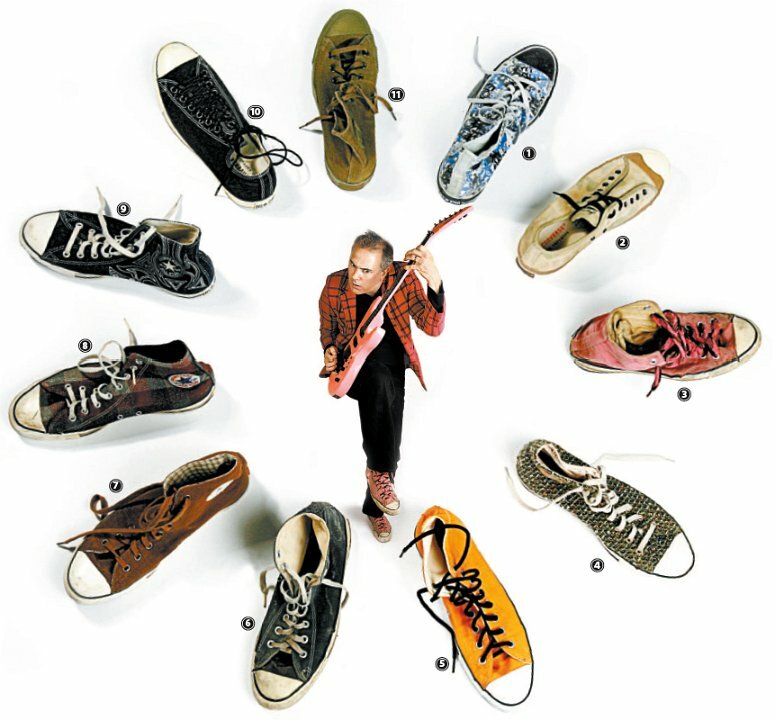 136 Group Shots of Chucks Rockers collection of chucks. 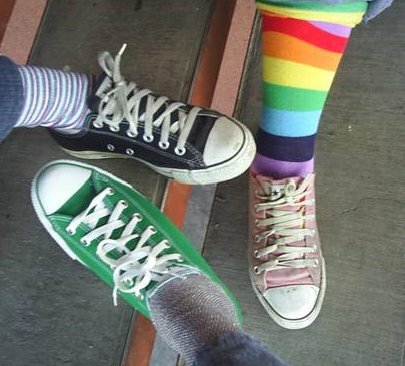 138 Group Shots of Chucks Three grils putting their best foot forward. 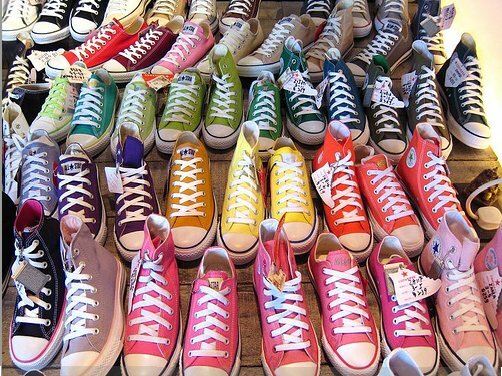 139 Group Shots of Chucks Collection of chucks from afar. 140 Group Shots of Chucks Blue, raspberry, and an interloper? 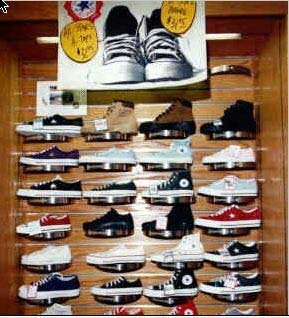 141 Group Shots of Chucks Store display of Converse Chuck Taylor shoes. 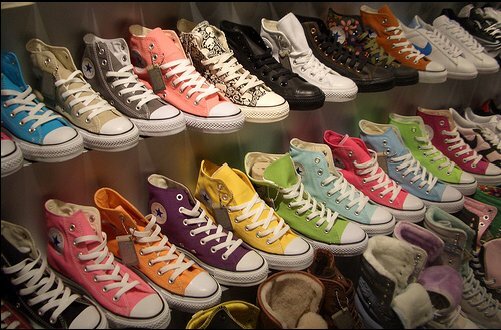 142 Group Shots of Chucks Store display of Converse Chuck Taylor shoes, shot 2. 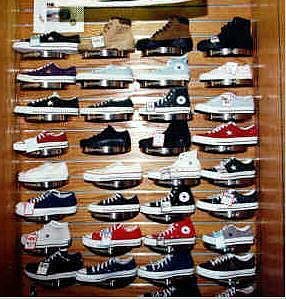 143 Group Shots of Chucks Store display of Converse shoes. 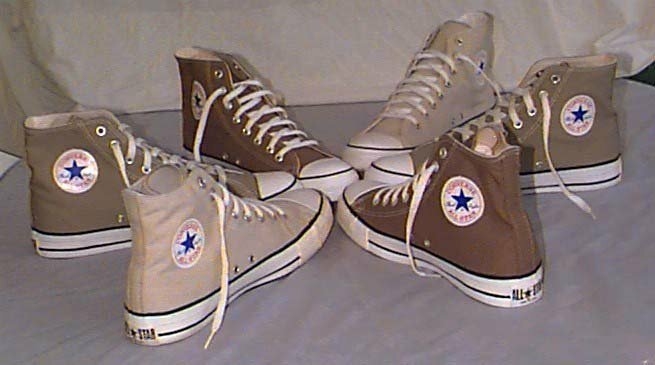 144 Group Shots of Chucks Three shades of brown high tops. 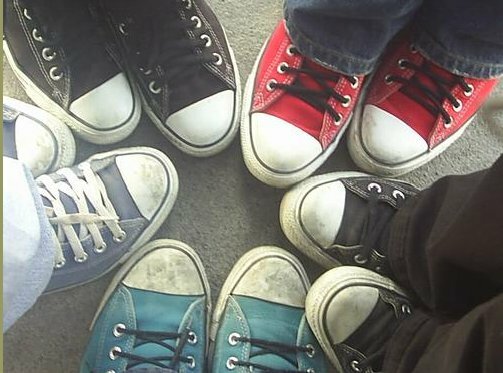 145 Group Shots of Chucks Black, brown, and blue high tops. 146 Group Shots of Chucks Black and tan chucks. 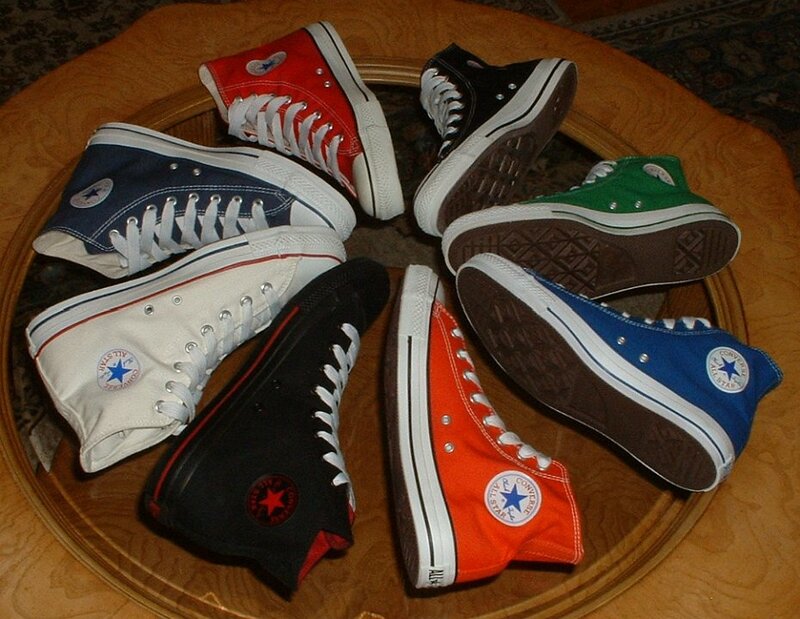 147 Group Shots of Chucks Wheel of worn and new high top chucks. 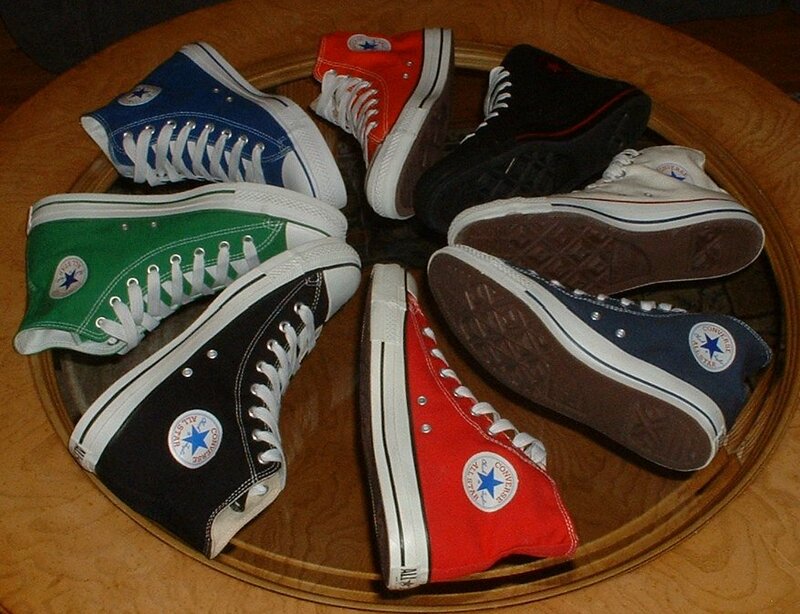 148 Group Shots of Chucks Wheel of black, optical white, blue, and red high top chucks. 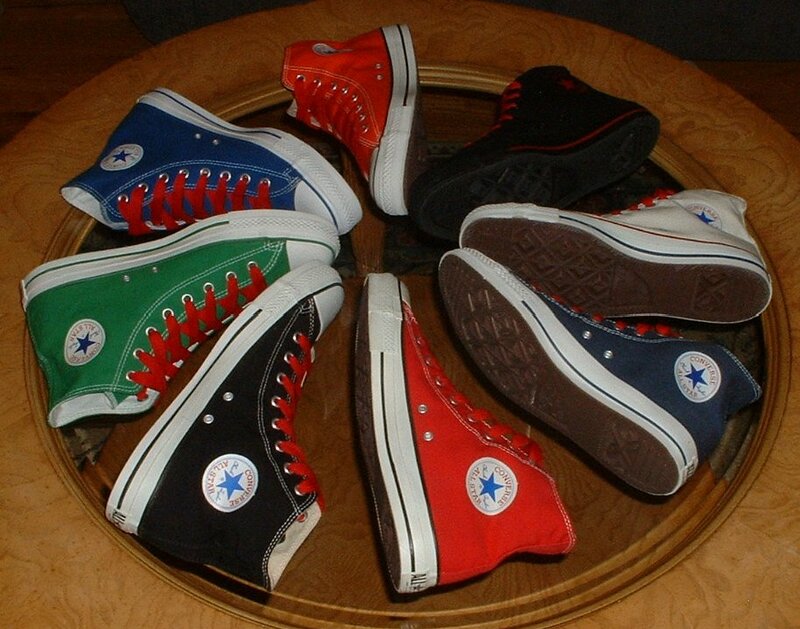 149 Group Shots of Chucks Wheel of red, orange, yellow, and flourescent green chucks. 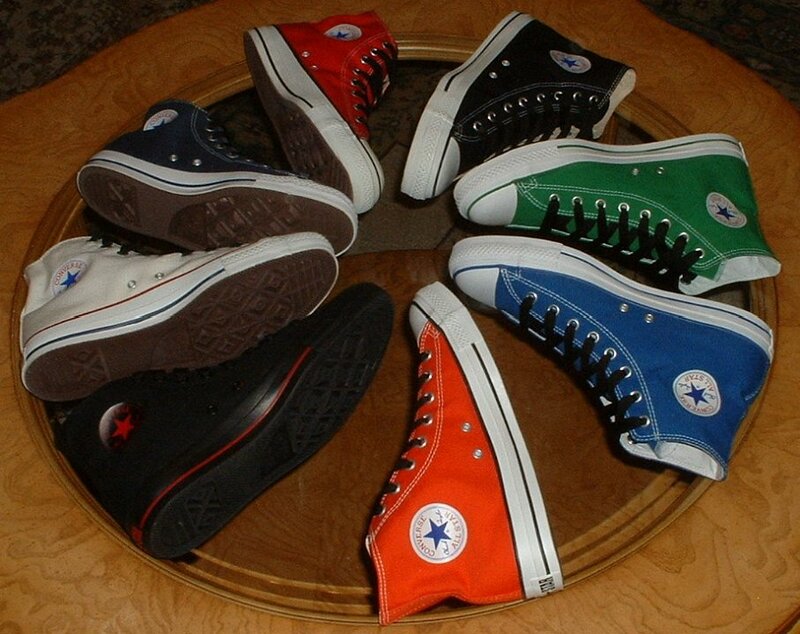 151 Group Shots of Chucks Wheel of assorted high top chucks. 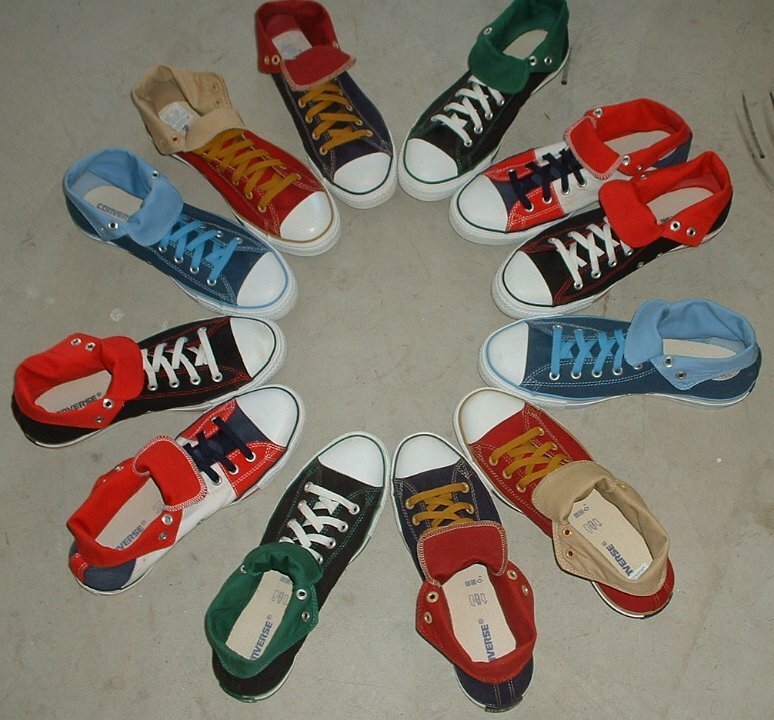 152 Group Shots of Chucks Half wheel of caribbean blue and taupe chuck high tops. 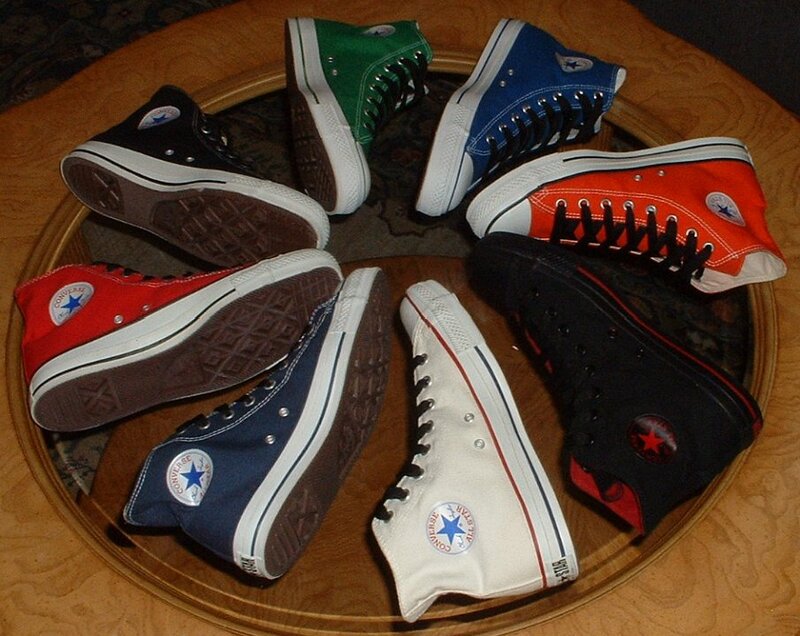 153 Group Shots of Chucks Wheel of black, blue, and light brown chucks. 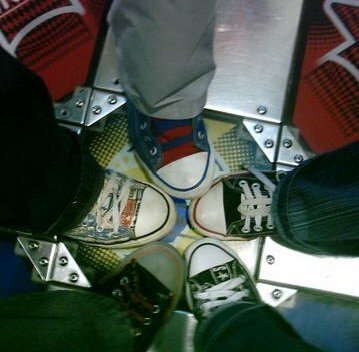 154 Group Shots of Chucks Wheel of brown Chuck Taylor high tops. 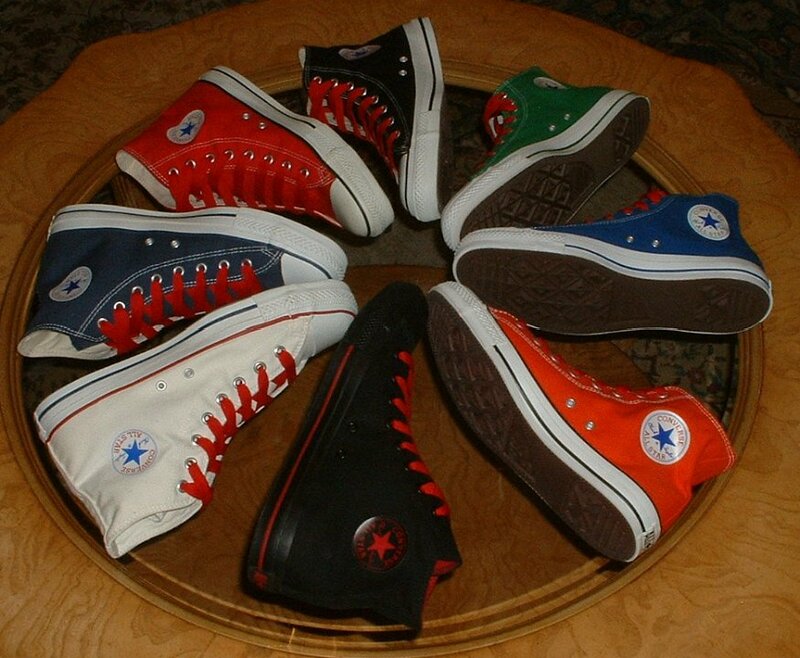 155 Group Shots of Chucks Wheel of seasonal chucks. 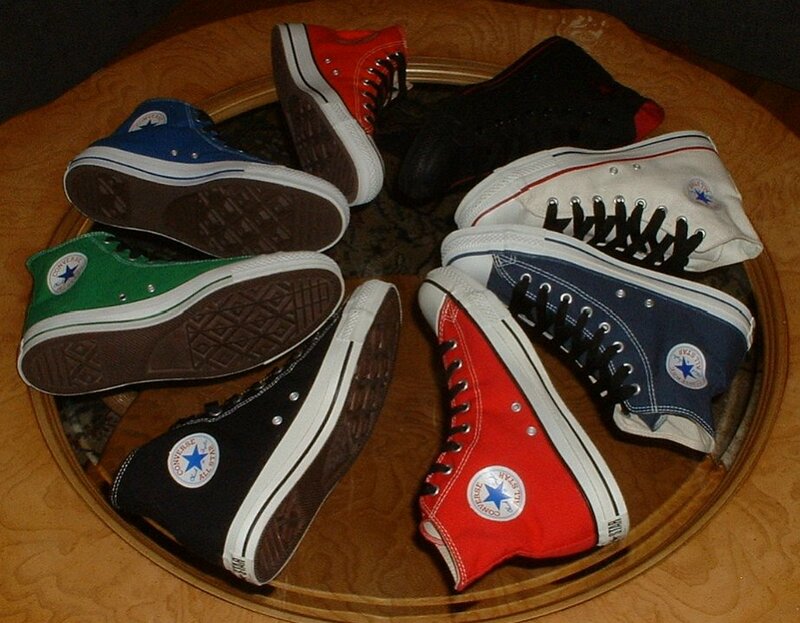 156 Group Shots of Chucks Wheel of red, green optical white, and navy blue high top chucks. 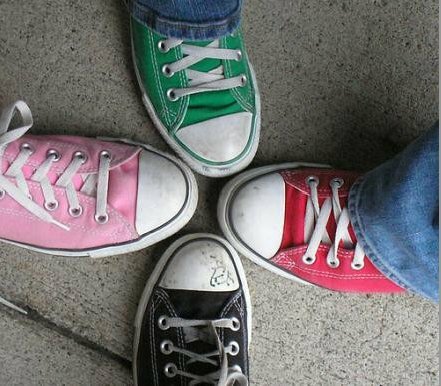 157 Group Shots of Chucks A quartet of pink, green, red, and black chucks. 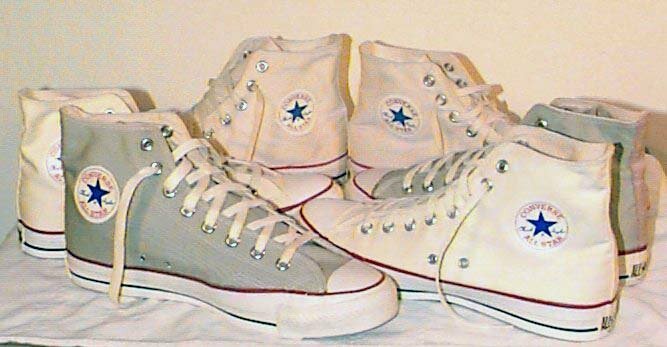 158 Group Shots of Chucks White and grey high top chucks. 159 Group Shots of Chucks Yellow and white high top chucks, inside patch view.